Sabbys keye (qu in London? ), II. 681. Sabyn or Sabyne, Wm., I. 688; II. g. 1311 (19). -,-, letter from, I. 688. Sacheverell, Sir Henry, I. g. 539 (9); II. 209, 417, 568. -,-, letter from, II. 417. -, (Secheverell), Hen., II. g. 1008 (43). -, Ralph, I. g. 539 (9); II. g. 1008 (43). Sackville or Sakevile, John, II. 1282: g. 1150 (18). -,-, signature of, II. 1282. -, Ric, signature of, II. 1282. Sacramentaries, I. 804 (p. 357). Sacraments, the, I. 70 i., 436, 541, 789 (p. 346), 790 (p. 347), 791, 818 ii., 8767, 901 (p. 405), 1021; II. 401, 4035, 407, 409, 436 (2). Sacred College, the. See Cardinals. Sadalar. See Sadler., the. See Cardinals. Sadbere. See Sedbergh., the. See Cardinals. Sadbery. See Sodbury., the. See Cardinals. Saddlery, a bill for, II. 186 (28). Saddleworth (Sadilworth) chapel, Yorks., II. 778. Saddryngton. See Settrington., Yorks., II. 778. 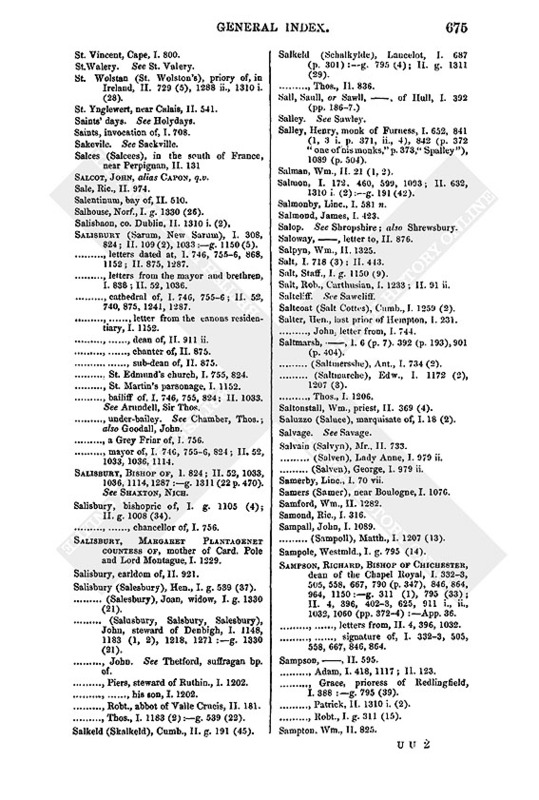 Sadler (Sadyller, Sadlare, Sadleyr, Sadelear, Saddeler, Sadeler, Sadalar), Ralph, of the Privy Chamber, I. 86, 200, 225, 259, 294, 397, 540, 760, 839, 844, 938, 9478, 10289, 1039, 1091, 1094, 1286, 1307, 1313:g. 1103 (13); II. 55, 166 (p. 55), 203 (p. 87), 242, 616, 661, 821, 827, 929, 975, 1079, 1122 ii. 1151 (2, 3), 1336, 1338:App. 15, 21, 44:g. 411 (33). -,-, letters from, I. 200, 259, 760; II. 821, 827, 1336:App. 44. -,-, letter to, II. 1338. -,-, instructions to, I. 540, 1313. -,-, his handwriting, I. 1091; II. 889. -,-, his wife, II. 821. Sadler, And., I. 581 n.
-, Chr., I. 632, 914. -, (Sadyller), Wm., II. 80. Sadolet James, bp. of Carpentras, cardinal (1536), I. 89, 526, 862; II. 214, 312. -,-, letter from, II. 214. Sadyller. See Sadler.-,-, letter from, II. 214. Saham, Camb. (qu. Soham? ), I. g. 311 (26). Sailiard. See Sulyard., Camb. (qu. Soham? ), I. g. 311 (26). Sainctmaur. See Seymour., Camb. (qu. Soham? ), I. g. 311 (26). Saint, John, I. 718 (4). St. Agatha's Abbey. See under Richmond., John, I. 718 (4). St. Alban's, Herts, II. 275, 705, 974. -, Abbey of, II. 256, 718, 722, 738, 747, 873, 1065, 1122 ii., 1151 (2, 3), 1209, 1296, 1314:g. 1008 (32). -,-, Robert Hobbes, abbot of, II. 718, 911 ii., 1060 (pp. 3734):g. 1008 (32). -,-, signature of, II. 718. -,-, prior of, II. 873. St. Andr, sieur de, II. 323 (2), 372 (p. 152). St. Andrew's. See Whitburn., sieur de, II. 323 (2), 372 (p. 152). St. Andrew's, in Scotland, archbishop of, I. 790; II. App. 15. -, archbishop of (t. Hen. VII. ), II. 186 (2). St. Androwes, prior of (qu. St. Andrew's, York? ), I. 639. St. Angelo, Cape, in Greece, I. 1190 (2); II. 509 (2). St. Anne's, Cornw., priest of, II. 1325. St. Asaph's, bpric. of, II. g. 191 (14). St Asaph's (St. Assez, St. Asse, St. Tasse), Robert Warton, Bishop of, II. 206 (p. 90), 402, 911 ii., 1060 (pp. 3734): g. 191 (14). St. Aubyn (Seyntabyn), Thos., II. g. 1150 (18). St. Baume, in Provence, I. 1329 (La Bausme). St. Bee's priory, Cumb., Robert Paddy, prior of, I. 1323, 640. St. Benett's. See Hulme, St. Benets. St. Boniface, I. of Wight, I. g. 539 (45). St. Bride, in Brecknock, I. g. 539 (2). St. Columb (Colombe), Cornw., letter dated at, I. 4. St Cross, Cardinal See Quignon, Francis. St. Cuthbert, banner of, I. 6 (p. 5), 901 (p. 410), 946 (2). St. David's, S. Wales, I. 93. -, letters dated at, I. 575, 597, 830, 1251. -, the bishop's house at, I. 597. -, chaunter of. See Lloyd, Thos. -, treasurer of. See Lewes, John. St. David's, Bishop of See Barlow, William. St. David's, Bishoprie of, I. 575. St. Einanus, Bangor dioc. (qu. Llanengan? ), II. g. 617 (12). St. Elizabeth. See under Winchester., Bangor dioc. (qu. Llanengan? ), II. g. 617 (12). St. Elyns. See St. Helens., Bangor dioc. (qu. Llanengan? ), II. g. 617 (12). St. Faith's. See Horsham St. Faith's., Bangor dioc. (qu. Llanengan? ), II. g. 617 (12). St. George, in Piedmont, I. 763. St. George, Guild of, II. g. 617 (10). St. George's feast, I. 193; II. 186 (63). St. Germain (Jermayn), an opinion of, II. 1151 (2). St. Germain, in France, letter dated at, I. 286. St. Gilbert, Order of, master of. See Holgate, Robert. St. Giles' in the Wood. See Flamsted., Order of, master of. See Holgate, Robert. St. Gilles, in Provence, II. 1254. St. Helen's (St. Elyns), in Wight, I. 438 (p. 211); II. 563, 708, 1006. St. Jalhe (Sancta Yawle), Didier de, late grand master of the Order of St. John, I. 2045, 207:g. 1103 (28); II. 663. St. John of Jerusalem, Order of (the Religion), I. 78, 192, 2047, 347, 1144:g. 1105 (7); II. 192, 224, 320, 355, 509 (2), 524, 792:g. 411 (25). -,-, great master of (office, &c.), I. 78 (2), 207. See Homedes, John. -,-, ships of, I. 1144, 1190; II. 320, 509 (2), 524. -,-, Turcopolier. See West, Sir Clement. St. John of Jerusalem, Priory of, in Clerkenwell, I. 264:g. 311 (50); II. 952. -,-, prior of (my lord of St. John's). See Weston, Sir Wm. -,-, sub-prior of, I. 347. St. John of Jerusalem, priory of, in Ireland. See Kilmainham. St. John, John, I. 623. -, (Sant Johne), Sir John, II. 810, 911. ii., 1060 (p. 374), 1151 (2, 3), 1297:g. 796 (18). -, Ralph, II. 1060 (p. 373). St. John's Rode, near Boulogne, I. 760. St. Katharine's. See under London; also Waterford., near Boulogne, I. 760. St. Keverne (Keveran), Cornw., I. 1001. St. Laurence, co. Dublin, II. 1310 i. (2). St. Leger (Sentleger, &c.), Anthony, of Ulcombe, chief commissioner in Ireland (15378), I. 1079, 1323; II. 37882, 3846, 388 (3), 632, 7234, 762, 959, 1137, 1302:g. 1311 (28). -,-, letter from, II. 632 See also Ireland, Commissioners in. St. Leger or Selenger (Seyntleger), Anne, I. g. 1330 (22); II. 1310 ii. (9). -, Antony (of Slindon), letter from II. 119. -, (Sellinger), Ant., brother of Arthur, I. 867. -, Ant., jun., I. g. 1330 (22). -, (Sentleger), Arthur, late prior of Leeds, I. 867. -, (Seintleger, Seyntleger), Sir George, dec., I. g. 1330 (22); II. 1310 i. (20), ii. (9). -, (Seyntleger), John, I. g. 1330 (22). -, Sir John, II. 911 ii. -, Robt., brother of Arthur, I. 867. St. Low (Seyntlow), Sir John, I. 11945; II. 690, 911 ii. -,-, letters from, I. 11945. -, (Sayntlow, Seintlowe, Sayntloo, Seintloo, Sayntclo), Wm., I. 394 (2); II. 76, 86, 135, 173, 382, 838, 859 (2), 898 (1, 2, 3), 1097, 1310 i. (46). St. Malo (St. Malowes), in France, ship of. See under Ships. St. Martin, castle beside St. Pol, II. 125. St. Martin, , I. 972; II. 961. St. Mawes (St. Modys), Cornw., II. 1325. St. Michael's Mount (the Mount), Cornw., II. 393, 595. St. Modys. See Mawes., Cornw., II. 393, 595. St. Neot's, Hunts., II. g. 1311 (20). -, priory of, II. 1314:g. 796 (18). St. Newlyn, Cornw., parish priest of, II. 1325. St. Omer (St. Tomers), in Flanders, I. 58, 961, 971 (St. Thomas), 980, 1017, 1074; II. 93 (2), 287, 305, 323, 326, 333, 366, 3712, 418, 442. -, letters dated at, I. 187, 239, 376; II. 3079, 327, 367, 391, 419, 442. St. Omer's gate, i.e., one of the gates of Terouenne, q.v. St. Oswald's priory. See Nostell., i.e., one of the gates of Terouenne, q.v. St. Osyth's (St. Osy) abbey, Essex, letter dated at, II. 495. -, abbot of, I. 1010. St. Pol (Sent Polle), in Artois I. 752, 826, 1181, 1322; II. 46, 93 (2), 1068, 113, 125, 212, 228, 372, 539, 598, 675. -, description of the siege, II. 125. St. Pol (Seynt Powlle, Sent Polle), count of, I. 347, 365, 556, 705, 826, 1166, 1329. St. Pol (Sentpole), Mr., II. 2. -, (Seyntpoll), Geo., II. g. 1150 (43). -, (Seyntpoll), John, II. g. 1150 (43). St. Pye, , councillor of Flanders, I. 1061. St. Quentin, in Picardy, I. 1329. St. Radegund's. See under Dover., in Picardy, I. 1329. St. Robert's. See under Knaresborough., in Picardy, I. 1329. St. Saulveur Dyves, II. 223. St. Sebastian, in Spain, I. 254. -, letter dated, II. 716 (2). St. Sepulchre's. See under Dublin.-, letter dated, II. 716 (2). St. Tasse. See St. Asaph's.-, letter dated, II. 716 (2). St. Thomas. See St. Omer; also Stafford, St. Thomas priory beside. St. Thomas' day (i.e. Becket), II. 231. St. Tomers. See St. Omer., II. 231. St. Valery (St. Walery), II. 253, 680. St. Venant, in Artois, I.; 1480 II. 372. St. Vincent, Cape, I. 800. St. Walery. See St. Valery., Cape, I. 800. St. Wolstan (St. Wolston's), priory of, in Ireland, II. 729 (5), 1288 ii., 1310 i. (28). St. Ynglewert, near Calais, II. 541. Saints' days. See Holydays., near Calais, II. 541. Saints, invocation of, I. 708. Sakevile. See Sackville., invocation of, I. 708. Salces (Salcees), in the south of France, near Perpignan, II. 131. Salcot, John, alias Capon, q.v. Salentinum, bay of, II. 510. Salhouse, Norf., I. g. 1330 (26). Salisbaon, co. Dublin, II. 1310 i. (2). Salisbury (Sarum, New Sarum), I. 308, 824; II. 109 (2), 1033:g. 1150 (5). -, letters dated at, I. 746, 7556, 868, 1152; II. 875, 1287. -, letters from the mayor and brethren, I. 838; II. 52, 1036. -, cathedral of, I. 746, 7556; II. 52, 740, 875, 1241, 1287. -,-, letter from the canons residentiary, I. 1152. -,-, dean of, II. 911 ii. -,-, chanter of, II. 875. -,-, sub-dean of, II. 875. -, St. Edmund's church, I. 755, 824. -, St. Martin's parsonage, I. 1152. -, bailiff of, I. 746, 755, 824; II. 1033 See Arundell, Sir Thos. -, under-bailey. See Chamber, Thos. ; also Goodall, John. -, a Grey Friar of, I. 756. -, mayor of, I. 746, 7556, 824; II. 52, 1033, 1036, 1114. Salisbury, Bishop of, I. 824; II. 52, 1033, 1036, 1114, 1287:g.1311 (22 p. 470) See Shaxton, Nich. Salisbury, bishopric of, I. g. 1105 (4); II. g. 1008 (34). -,-, chancellor of, I. 756. Salisbury, Margaret Plantagenet countess of, mother of Card. Pole and Lord Montague, I. 1229. Salisbury, earldom of, II. 921. Salisbury (Salesbury), Hen., I. g. 539 (37). -, (Salesbury), Joan, widow, I. g. 1330 (21). -, (Salusbury, Salsbury, Salesbury), John, steward of Denbigh, I. 1148, 1183 (1, 2), 1218, 1271:g. 1330 (21). -, John. See Thetford, suffragan bp. of. -, Piers, steward of Ruthin., I. 1202. -,-, his son, I. 1202. -, Robt., abbot of Valle Crucis, II. 181. -, Thos., I. 1183 (2):g. 539 (22). Salkeld (Skalkeld), Cumb., II. g. 191 (45)..
Salkeld (Schalkylde), Lancelot, I. 687 (p. 301):g. 795 (4); II. g. 1311 (29). Sall, Saull, or Sawll, , of Hull, I. 392 (pp. 1867.). Salley. See Sawley., Saull, or Sawll, , of Hull, I. 392 (pp. 1867.). Salley, Henry, monk of Furness, I. 652, 841 (1, 3 i. p. 371, ii., 4), 842 (p. 372 "one of his monks," p. 373, "Spalley"), 1089 (p. 504). Salman, Wm., II. 21 (1, 2). Salmon, I. 172. 460, 599, 1093; II. 632, 1310 i. (2):g. 191 (42). Salmonby, Linc., I. 581 n.
Salop. 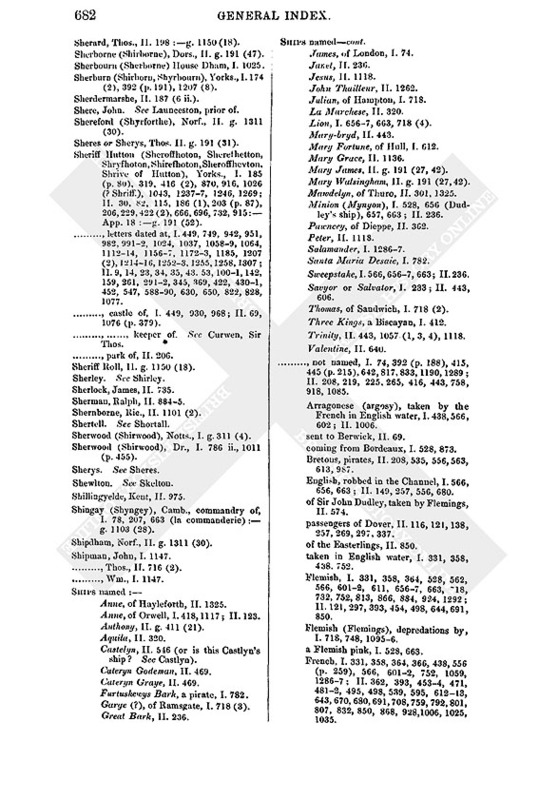 See Shropshire; also Shrewsbury., James, I. 423. Saloway, , letter to, II. 876. Salt, I. 718 (3); II. 443. Salt, Staff., I. g. 1150 (9). Salt, Rob., Carthusian, I. 1233; II. 91 ii. Saltcliff. See Sawcliff., Rob., Carthusian, I. 1233; II. 91 ii. Saltcoat (Salt Cottes), Cumb., I. 1259 (2). Salter, Hen., last prior of Hempton, I. 231. -, John, letter from, I. 744. Saltmarsh, , I. 6 (p. 7). 392 (p. 193), 901 (p. 404). -, (Saltmersshe), Ant., I. 734 (2). -, (Saltmarche), Edw., I. 1172 (2), 1207 (3). Saltonstall, Wm., priest, II. 369 (4). Saluzzo (Saluce), marquisate of, I. 18 (2). Salvage. See Savage., marquisate of, I. 18 (2). Salvain (Salvyn), Mr., II. 733. -, (Salven), Lady Anne, I. 979 ii. -, (Salven), George, I. 979 ii. Samerby, Linc., I. 70 vii. Samers (Samer), near Boulogne, I. 1076. -, (Sampoll), Matth., I. 1207 (13). Sampole, Westmld., I. g. 795 (14). Sampson, Richard, Bishop of Chichester, dean of the Chapel Royal, I. 3323, 505, 558, 667, 790 (p. 347), 846, 864, 964, 1150:g. 311 (1), 795 (33); II. 4, 396, 4023, 625, 911 i., ii., 1032, 1060 (pp. 3724):App. 36. -,-, letters from, II. 4, 396, 1032. -,-, signature of, I. 3323, 505, 558, 667, 846, 864. -, Adam, I. 418, 1117; II. 123. -, Grace, prioress of Redlingfield, I. 388:g. 795 (39). -, Patrick, II. 1310 i. (2). -, Robt., I. g. 311 (15). Sancta Yawle. See St. Jalhe., Henry, II. 215. Sandall, Yorks., II. g. 1150 (27). -, castle of, I. 930; II. g. 617 (8). Sandeforthe. See Sandford.-, castle of, I. 930; II. g. 617 (8). Sanderdale hill, Cumb., I. 687 (pp. 300, 303). Sanders, Wm., I. 370 (2 ii.). Sanderson or Saunderson, , of Resonby, I. 70 ii. -, Chr., I. 201 (pp. 86, 88), 392 (pp. 1824). -, Hen., I. 581 n.
-, Nich., I. 70 iv., viii., x. xii. 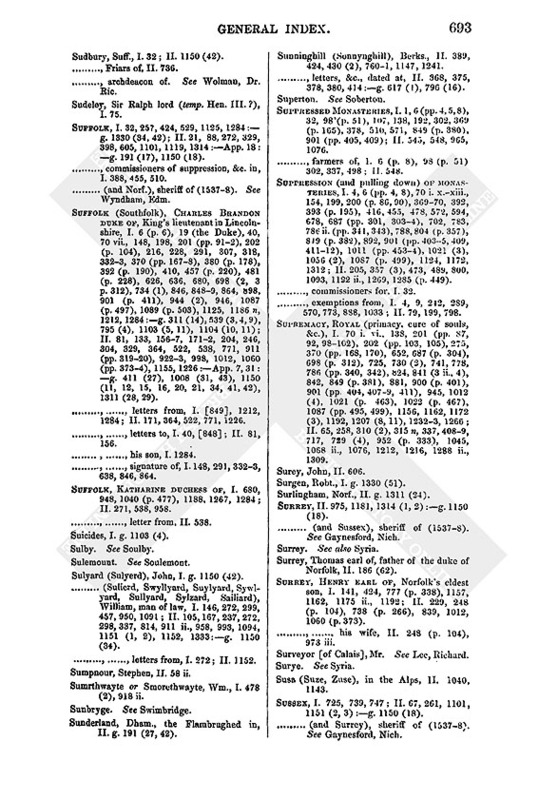 Sandes (Sandys, Sanes, Sanse, Chans), William Lord, K.G., lord chamberlain of the Household, captain of Guisnes, I. 17, 86, 151, 195, 237, 299, 349, 450, 457, 589, 627, 750, 873 (p. 393), 885, 9367, 954, 961, 971, 1016, 1041, 1072, 1075, 1137, 1140, 1179, 1218, 1230, 1275, 1280:g. 539 (11); II. 11, 37, 93, 99, 113, 117, 134, 162, 166 (p. 55), 168, 395, 423 463, 466, 470, 564, 573, 612, 661, 710, 773, 8012, 911 ii., 941, 994, 1012, 1060 (p. 373), 1037, 1103, 1105, 1151 (2, 3), 1241, 1307:App. 22, 34:g. 1150 (1). -,-, letters from, I. 17, 151, 589, 627, 750, 885, 936, 954, 961, 971, 1016, 1041, 1137, 1140, 1179, 1230, 1275, 1280; II. 11, 37, 93, 113, 117, 134, 168, 463, 470, 573, 710, 773, 8012, 941, 994, 1105:App. 22, 34. -,-, letters to, I. 937; II. 99. -,-, his wife, I. 750. Sandes, or Sandys, Mr. II. 1267. -, Ant., II., 1337:g. 1150 (18), 1311 (28). -,-, letter from, II. 1337. -, (Sandis), John, son of lord Sandes and his deputy at Guisnes, I. 17 (p. 13), 589 (1, 2); II. 113. -, Sir John, II. 1060 (p. 373). -, (Sands), Sir Ric., II. 105, 911 ii., 1060 (p. 374). Sandesend, Yorks, I. 533 (p. 247). Sandewiche. See Sandwich., Yorks, I. 533 (p. 247). Sandford, Nich., I. g. 1330 (20). -, (Sanford), Thos., I. g. 795 (4); II. 249 (6), 250 (I ii. ), 836:g. 1311 (29). Sandforth (Sandefurth, Standeforthe), Westmld., I. 687 (2). -, Moor, I. 687 (2). Sandon, Essex, II. g. 191 (40). Sandon, Sir Wm., I. 70 iv., viii., x., xii., 380 (p. 176); II. g. 1150 (18). Sandwich, Kent, I. 566, 718 (2, 3); II. 136, 846 iii., 1108, 1296. -, letter dated at, II. 846 ii. -, St. Bartholomew's Hospital, II. 136. -, customer of. See Alcock. Sandwich, Thos., alias Prestwich, q.v. -, (Sandwyche, Sandewiche). Wm., B.D., warden of Canterbury College, Oxford, I. 437; II. 412. -,-, letter to, II. 412. Sangannagh, co. Dublin, II. 1310 i. (37). Sankey, Chr., I. 873 (p. 393). San Lis. See Senlis., Chr., I. 873 (p. 393). San Remo, Geronimo, II. 320. Sanse. See Sandes., Geronimo, II. 320. San Sebastion. See St. Sebastian., Geronimo, II. 320. "Sanselym" face, man with a, II. 340, 422, 431, 479. Sansere, the count, I. 826. Santa Maura (Santa Mavero), in the Ionian Islands, II. 524. Santander (Sant Tander), in Spain, I. 254. Sant Johne. See St. John., in Spain, I. 254. Sapcotes (Scapcotts, Sapcootys), Sir Ric., I. 734 (8):g. 1105 (11); II. 29. -,-, letter from, II. 29. Sapperton (Saperton, Sapton), Linc., II. 187, (4, 5 ii., 6). Saracens, II. 320, 524 (skeras), 1325. Saragossa (Seragoza), in Spain, II. 131, 228. Saragoze. See Syracuse., in Spain, II. 131, 228. Sarisbury, Hants, II. g. 1311 (40). Sark (Serke), one of the Channel Islands, II. g. 191 (46). Sarmiento de Mendoza, Luis, Imperial ambassador in Portugal, I. 565, 723, 753, 772; II. 227, 240, 1112. -,-, letters from I. 565 (1, 2), 772; II. 227. -,-, letters to, I. 723; II. 240, 1112. Sarsewell, John, clk., II. 1310 ii. (9). Sart, sieur du. See Du Blioul. Saulmes, Mons. de, II. 1307. Saunders, Ant., II. g. 1311 (14). -, (Sawndurs), Thos., I. 701. -, Wm., letter from, II. 1269. Saunderson. See Sanderson.-, Wm., letter from, II. 1269. Saundieforth, II. 1212 (p. 427). Saunton, Rob., II. 1008 (30). Savage, Edw., I. g. 539 (43). -, Elizabeth lady, widow of Sir John Savage and of Wm. Brereton, I. 1170:g. 795 (38). -,-, letter from, I. 1170. -, John, I. g. 539 (43); II. 1102 (2), 1215. -, Sir John, dec., I. g. 795 (38). -, (Salvage), Ric., II. 1310 i. (2), ii. (I bis). Savell (Sayvell), Henry, II. 186 (35, 50.). -,-, Eliz. (Bess Sotehill), divorced wife of, II. 186 (50, 59, 65). -, (Sayvell, Sayvylle, Seyvell, Savill), Sir Henry, sheriff of Yorkshire (15378), I. 260, 281, 425, 698 (2), 7834, 849 (pp. 379, 3823), 1087 (p. 497), 1159 ii., 1172 (2), 1178, 1207 (4), 1228, 1285; II. 102 (5), 179, 316, 339, 369 (1, 3, 5), 650, 984, 1060 (p. 374):g. 1150 (18). -,-, letters from, I. 281, 783; II. 339, 984. -,-, letters to, I. 260, 425, 1178, 1285. -,-, sayings of, II. 316. -,-, questions for, II., 369 (5 ii.). -, John, I. 671 (2 iii.). -, (Sayvel, Savyle), Thos., I. 1178, 1227 (8); II. 339:g. 1150 (11). Savern. See Severn.-, (Sayvel, Savyle), Thos., I. 1178, 1227 (8); II. 339:g. 1150 (11). Saveuses (Saveusse), Anthoinette de, letters from, I. 76, 180, 719, 827, 1248; II. 198, 360, 615, 675. -, Jenne de. See Riou, madame de. -, Mons. de, father of the preceding, II. 675. Savigliano (Savilian), in Piedmont, I. 366 (2), 696. Savona, near Genoa, II. 656. Savoy and the Savoyards, I. 556, 762; II. 46, 104, 1040, 1104, 1217. Savoy, Beatrice duchess of, sister of the Empress, I. 122 (p. 59), 366 (4); II. 18 (2), 245. Savoy, Charles II. duke of, I. 122 (pp. 589), 366 (4), 556, 762, 1329; II. 18 (2), 245 (p. 102), 1148. -,-, his son. See Piedmont, Lewis prince of. Sawcliff (Sauclyf, Saltcliff), Linc., I. 6, 901. Sawley (Salley, Saulley, Sawlley) Abbey, Yorks., I. 281, 383, 391, 393 (p. 195), 408, 416 (2), 479, 4901, 506, 632, 695, 706, 847 (13), 848 (p. 378), 914 (p. 416), 1020, 1034, 1086, 1088; II. 59, 205 (p. 89), 291 ii. -, monks of, I. 6 (p. 6), 7, 841 (3 p. 371, 4), 1087 (p. 498, 501). -, abbot of, I. 218, 247, 393 (p. 195), 4901, 506, 577, 666, 1014, 1020, 1034, 1086, 1087 (pp. 496, 501). -,-, servant of. See Shuttleworth, Thos. or George. Sawll. See Sall.-,-, servant of. See Shuttleworth, Thos. or George. Sawte, Hen., II. g. 1008 (3). Sawtey, in Holderness, I. 380 (p. 178). Sawtry (Sawtrey) Abbey, Hunts., II. 1209:g. 1311 (20). -, Robt., abbot of, II. g. 1311 (20). -, Wm., abbot of, II. g. 1311 (20). Sawtry Bemes, Hunts., II. g. 1311 (20). Sawtry "Juet," Hunts., II. g. 1311 (20). Sawtry Monachorum, Hunts, II. g. 1311 (20). Sawtry Moynes, Hunts., II. g. 1311 (20). -, (Sawier), John, I. 567. Saxey, Wm., prb. of Willesdon, II. 720. Saxony, John Frederic, duke of, elector. I. 564, 745, 790; II. 32, 245 (p. 102), 10889, 1148, 1151 (2). -,-, letters from, II. 10889. -,-, signature of, I. 745. Say, W., notary, I. 12323. Saymer or Sayntmor. See Seymour., W., notary, I. 12323. Sayse, Walter, II. 1310 i. (45). Sayvell. See Savell.-, Thos., I. 1178. Scaglethorpe (Skagelthorp), Yorks., II. 188. Scampston (Scamston), Yorks., I. 174 (2). Scanno, Guron, letter from, II. 1128. Scapcotts. See Sapcotes., Guron, letter from, II. 1128. Scarborough (Scardeburg, Skarburgh, Skerbrow), Yorks., I. 6, (pp. 6. 8), 64, 104, 143, 157 ii., 172, 184, 201 (pp. 857, 904, 979), 202, 2345, 369 (pp. 1656), 370, 393 (p. 195), 409, 416 (2), 533 (p. 247), 558, 578 (p. 267), 683, 730 (2), 916, 1021 (3), 1084, 1087 (pp. 4956), 1207 (8), 1237, 1286; II. 6, 122, 186 (12), 291, 733, 1212 (p. 427). -, letters dated at, I. 2345, 248, 651. -, bailiffs and officers of, I. 369 (pp. 1656), 1087 (p. 496). -, castle of, I. 95, 102, 136, 140I, 198, 234, 271, 369 (pp. 1656), 392 (p. 186), 409, 533, 535, 900 (p. 401), 930, 1019, 1020 ii., 1022, 1091:g. 311 (9, 10); II. 828, 1012 vi. -,-, constable of. See Ewers, Sir Ralph, jun. -, Grey Friars, I. 369 (p. 166). -,-, Friar Chapman, warden of, II. 1212 (p. 427). -, parsonage of, I. 535. -, White Friars, John Borrowby, prior of, II. 1212 (p. 427). Scardeburg. See Scarborough.-, White Friars, John Borrowby, prior of, II. 1212 (p. 427). Scardingwell, Yorks., I. g. 795 (12). Scargill (Skargill), , I. 466; II. 186 (1). -, Wm., I. 1226; II. 160. Scarlet or Scarlit, , Norfolk's servant, I. 731 (p. 323); II. 291 (p. 120). Scarning (Skernyng), Norf., II. g. 1311 (30). Scartho, Linc., I. 581 ii. Scawsby lease (Scawisby Leys, Skawsby leas), Yorks., I. 201 (pp. 90, 102), 370, 392 (p. 191). Scelle, John, II. 186 (73). Scemley. See Semble., John, II. 186 (73). Scepperus (Scerperius, Scepero, Skepperus), Dr. Cornelius, II. 372 (2), 511 (2), 7012, 832, 1053. -,-, letter to, II. 511 (2). Schere, John. See Launceston, prior of. Schien. See Skeen., John. See Launceston, prior of. Schmalkalden. See Smalcald., John. See Launceston, prior of. Schomberg, Nicholas. See Capua, Cardinal of. Schore, Louis, II. 633, 1243. Schyrme, the, in the Ionian Sea, II. 524. Scilly (Sylly) Islands, II. 393, 556. Sclaffardston, co. Meath, II. 1310 i. (10). -, Wm., dec., II. 186 (26). Sclavonia, in Hungary, I. 924. Sclews or Scluse. See Sluys., in Hungary, I. 924. Scopia, in Turkey, II. 509 (2). Scorlok, Barnaby, II. 1310 i. (37). -, Rob., II. 1301 i. (37). Scot or Scote, Barnard, I. 1190 (2); II. 129. Scotby, Cumb., II. g. 191 (45). Scotch suits at Rome, I. 423. 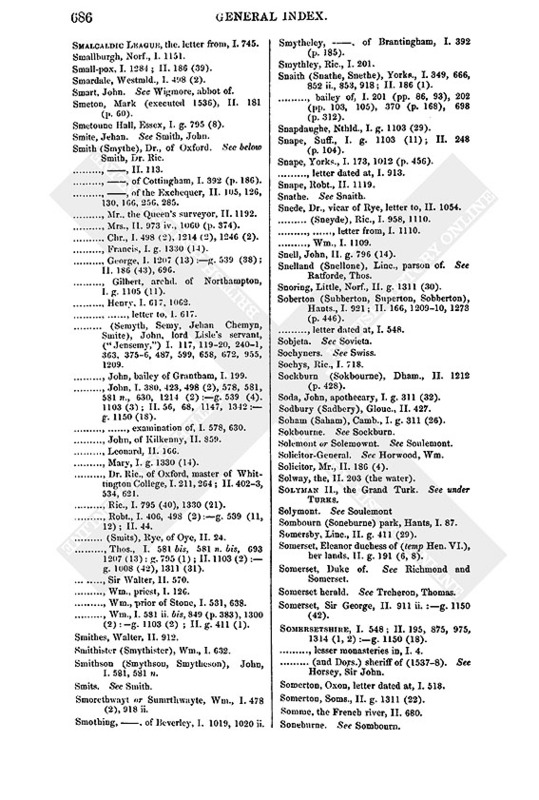 Scotherne (Scothorne), Linc., I. 765 (2 n.). -, vicar of. See Alenson, John. Scotland and the Scots, I. 6 (p. 5), 34, 712, 86, 225, 259, 294, 333, 368, 394 (2), 397, 414, 445 (p. 215), 463 (p. 222), 467, 525, 534, 540, 595 (p. 274), 647, 668, 687 (p. 303), 696 (p. 309), 7612, 777 (p. 338), 782, 804, 80910, 839, 843, 859, 882, 919, 923, 944 (1, 2), 952, 991, 1012, 1023, 1026, 1038, 1050, 1058, 1060, 1087 (p. 495), 1090 (p. 505), 1092, 1094, 1156, 1175 ii., 1216, 1238, 1256, 1286, 1307, 1313, 1323:g. 1103 (12); II. 6, 61, 74 (3), 80, 142, 152, 166 (p. 55), 186 (2, 27, 38, 62), 203 (pp. 867), 205 (p. 89), 212, 219, 238, 243, 291, 332, 369, 370, 422, 537, 539, 548 (p. 206), 549, 590, 616, 635, 642, 696, 732, 8289, 918, 929, 990, 1025, 1045, 1076, 1158, 1231:App. 12, 15, 18, 19:g. 191 (27, 42), 411 (17). -, Chancellor of. See Glasgow, G. abp. of. -, Comptroller of. See Colvill, Sir Sir James. -, Council of, I. 397, 839, 843, 859, 952, 1026, 1094, 1156; II. 666:App. 19. -,-, letter to, I. 859. -, Grand Customer of. See Chisholm, John. -, Great Seal of, an impression, I. 453. -, King of. See James V.
-, lords of, I. 1094. -, Marches of ("the Borders,"), I. 303 (p. 137), 422, 5945, 636, 651, 667, 804, 839 (2), 858, 864, 973, 1058, 1091, 1118, 1307, 1315; II. 142, 152, 154, 186 (32, 62), 229, 249, 370, 441, 650, 712 (p. 256), 1016, 1079, 1158: App. 19. -,-, fortresses upon, I. 930. -,-, pensioners on, I. 1091; II. 1151. -,-, Scotch wardens, II. 666:App. 12. East (East and Middle) Marches, I. 2225, 505, 839, 8578, 916, 919, 973, 1062, 1090 (pp. 5045); II. 154, 192, 124950, 332, 914 (2, 3). -, Council of, letter from, I. 421. -,-, letter to, I. 422. -, wardenship of, I. 151, 225, 291, 373, 636, 667, 774. -, appointment of deputy warden, I. 2225, 319. -, deputy warden. See Evers, Sir Wm. Middle Marches, I. 2225, 291, 373, 421, 505, 667, 839, 8578, 916, 919, 973, 1086 ii., 1090 (pp. 4045); II. 154, 192, 24950, 537, 914 (2, 3). -, appointment of deputy warden, I. 2225. -, deputy warden. See Widdrington, Sir John. -, Scotch warden. See Kerr, Andrew. -, pensioners of the East and Middle Marches, I. 222, 225, 351; II. 154, 192. West Marches, I. 39, 71, 222, 336, 3723, 505, 595 (p. 274), 636, 641, 857, 916, 919, 973, 994, 1030, 1050, 1060, 1215, 1315; II. 1545, 164, 186 (21), 192, 203, 233, 249 (37), 250 I ii., 24), 254, 537, 6412, 829, 914 (2), 979, 990:g. 191 (51). -, wardenship of, I. 3723, 594, 904, 914. -, lord warden of. See Cumberland, H. earl of. -, deputy warden of. See Wharton, Sir Thos. -, pensioners of, II. 1545, 642. -, Papal nuncio to. See Laurerius Dionysius. -, Parliament of, II. 666, 696. -, Queen of, II. 829. See Magdalen. -, Queen Dowager of. See Margaret. -, Regents of, I. 453, 552, 839 (2), 952, 1156, 1286; II. App. 12, 18, 19. -,-, letters from, I. 453; II. App. 12. -, Treasurer. See Aberdeen, bp. of. Scots, individual, I. 703, 777 (p. 338); II. 80, 181, 422 (2). Scots' field, the. See Flodden. Scott Willoughby (Wyllughby), Linc., parson of. See Gibb, Thos. Scott, Anne, widow, II. g. 1008 (14). -, Gilbert, I. 280; II. 186 (68). -, Sir John, II. g. 1008 (14). -,(Skott), John, of Watton, I. 201 (p. 93), 202 (p. 105). -, (Skotte), John, II. g. 1311 (35). -, Raynold or Reginald, II. 959:g. 1008 (14). -, T., II. 186 (68). -, (Scot), Thomas, of Pitgorno, letter from, II. 1158. -, Wm., II. g. 1008 (14). Scottish character, I. 5, 398. Scotton, Yorks., I. g. 795 (12). Scraptune, Dan Ralph, alias Swensune, q. v.
Screne. See Skreen., Dan Ralph, alias Swensune, q. v.
Screvin. See Skrevyn., Dan Ralph, alias Swensune, q. v.
Screysbury. See Shrewsbury., Dan Ralph, alias Swensune, q. v.
Scriptures. See Bible., Dan Ralph, alias Swensune, q. v.
Scrivelsby (Skerlehee), Linc., I. 70 xii. Scriven (Scryven, Shryne), Thos., Carthusian, I. 1233; II. 91 ii. -, Thos., II. g. 191 (50). Scriven. See also Skrevyn.-, Thos., II. g. 191 (50). Scrobie. See Scrooby.-, Thos., II. g. 191 (50). Scrooby (Scrobie, Scrowby), Notts., I. 1022 (p. 467), 1175 ii. Scrope (of Bolton), John Lord, I. 6 (pp. 5, 7), 253, 292, 369 (p. 166), 392 (p. 191), 698 (p. 312), 789, 1035 (p. 474), 1092; II. 548 (2); 741 (p. 267), 999, 1076 (p. 379), 1181:g. 1150 (11). -,-, letters from, I. 253; II. 999. Scryne. See Skryne.-,-, letters from, I. 253; II. 999. Scudamore (Skudamore), John, I. 30, 819:g. 539 (3). -,-, letters from, I. 30. Sculcoates (Skowcottes), Yorks., I. 392 (pp. 1889). Sculthorpe (Skulthorpe), Norf., II. g. 1311 (30). Scutte. See Skutt., Norf., II. g. 1311 (30). Seaford (Seford, Seffourthe, Seeford), Suss., I. 739, 748; II. g. 1008 (3), 1311 (34). Seal, a tame, I. 337, 555. 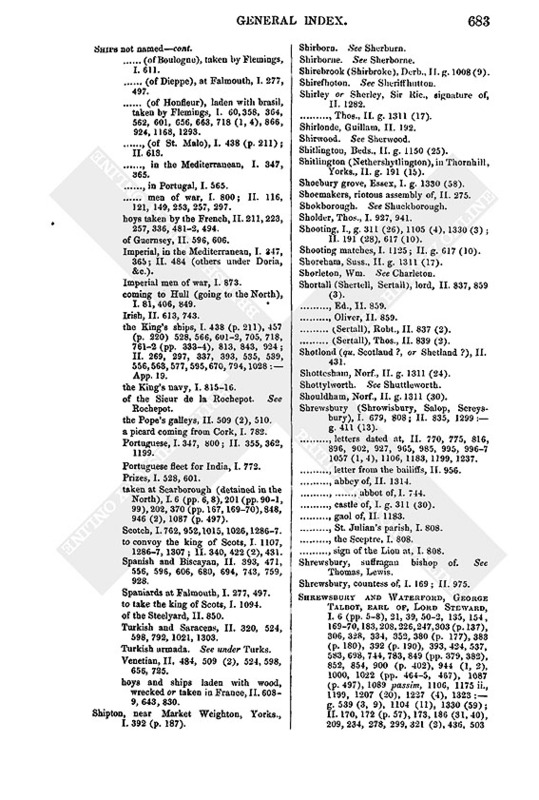 Seamer (Semere, Seymer, Semer), Yorks., I. 392 (p. 193), 393, 467, 1199 (2), 1207 (8). -, constable of, I. 369 (p. 165). Seamowre. See Seymour.-, constable of, I. 369 (p. 165). Seaton (Ceton), Cumb., I. 18. Seaton (Setton, qu. Seaton Ross? 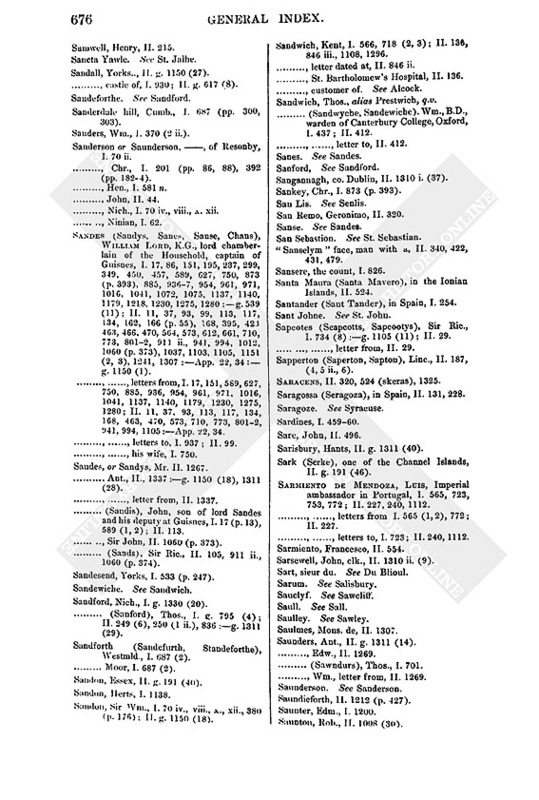 ), Yorks., I. 698 (p. 313). Sechebroke. See Sedgebrook., qu. Seaton Ross? ), Yorks., I. 698 (p. 313). Secheverell. See Sacheverell., qu. Seaton Ross? 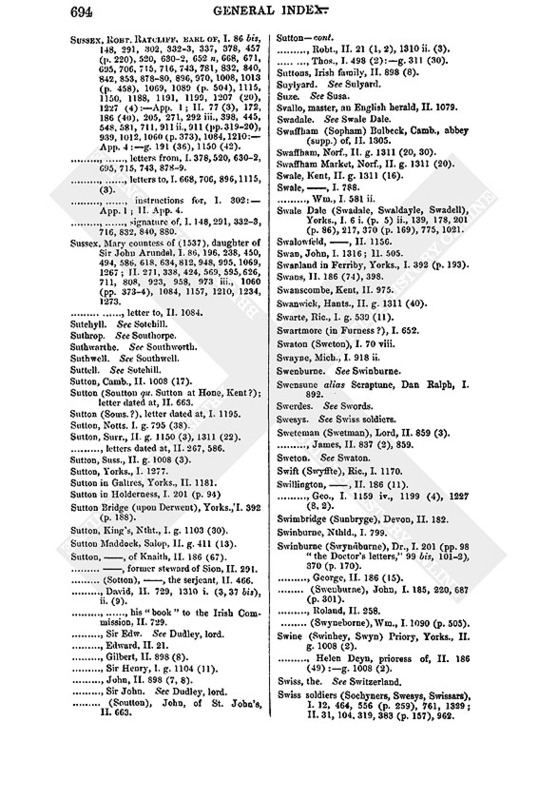 ), Yorks., I. 698 (p. 313). Secretary, lord. See Cromwell, lord. Seculery Firmery (Monm.? ), I. g. 795 (16). Sedan, Sieur de. See La Marck, Robert de. Sedbergh (Setbaurgh, Sedber, Settbeirgh, Sadbere, Sedbarr, Sedbere, Sedbery, Sedbury), Yorks., I. 6 (p. 6), 39, 136, 362, 392 (p. 194), 632, 901 (p. 405), 914 (pp. 41516), 959. Sedbergh (Sedber), Adam, abbot of Jervaulx, q.v. Sedgebrook (Sechebroke), Linc., I. g. 1103 (11). Sedgley (Segelley), Staff., I. 1263. Seditious Rumours, treasonable or unseemly words, &c., I. 62, 126, 200, 567, 572, 588, 589 (1, 2), 627, 685, 797, 808, 841, 881, 892, 897, 900, 901 (pp. 4034), 927, 941, 969, 990, 10001, 1182, 1271, 1294, 1327; II. 353, 357, 515, 622, 800, 918, 1216, 1269, 1299 (p.455). Seditious songs and rhymes, I. 424, 784, 1019, 1020 ii., 1021 (3, 4); II. 291, 339, 436 (2). Sedryngton. See Settrington., I. 424, 784, 1019, 1020 ii., 1021 (3, 4); II. 291, 339, 436 (2). Segroyte Park, in Wales, I. g. 795 (7). Segynworth, Hants, II. g. 1311 (40). Sekford, Thos., II. g. 1150 (42). Seland. See Zealand., Thos., II. g. 1150 (42). Selby, Yorks., I. 136, 1022, 1062. Selby, John, of Branxton, II. 249, 250 (1, 5). Selenger. See St. Leger., John, of Branxton, II. 249, 250 (1, 5). Sell, Hen., II. g. 1008 (37). Seller, Father, I. 995, 1040, 1069. Sellers (Selers), John, alias Taillor, I. 1300 (2, 3). Sellinger. See St. Leger., John, alias Taillor, I. 1300 (2, 3). Selskyr monastery. See under Wexford., Rob., I. 1159. Selve (Selva), George de, Bishop of Lavaur (della Vaura), French ambassador at Rome, I. 14, 464, 516, 625. -,-, letters from, I. 14, 516. Semble (Symley, Semblye, or Scemley), John, I. 1056 (1, 2), 1300 (2, 3). Semer. See Seymour., Semblye, or Scemley), John, I. 1056 (1, 2), 1300 (2, 3). Semere. See Seamer; also Seymour., Semblye, or Scemley), John, I. 1056 (1, 2), 1300 (2, 3). Semper, Robt., alias Ross, I. 966. Sempringham, the Order of (i.e., Gilbertines), I. 201 (p. 101). -,-, master of. See Holgate, Robert. Sempringham Priory, Linc., II. 187 (6), 202. Semy, Jean. See Smith, John. Semyth. See Smith., Jean. See Smith, John. Sennall, John, I. g. 1330 (11). Sendrye, Dav., I. g. 539 (25). Sendy or Sendye, , I. 450, 860; II. 84, 626, 923. Senes. See Sennes., , I. 450, 860; II. 84, 626, 923. Senis, Philip de, bp. of Mirepoix, II. 1176. Senkelere, Symon and Margaret, I. 75. Senlis (San Lis), in France, I. 414. Senlis, Jenne de, wife of Du Bies, II. 879, 899. -,-, letter from, II. 879. -,-, her daughter, II. 879. Sennes or Senes (Senvys), Wm., II. 436, 925. -,-, indictment of, II. 436 (2). Senok, Dr. John, II. 1101 (2). Senton, John, I. g. 1105 (10). Sent Polle. See St. Pol., John, I. g. 1105 (10). Senyngton. See Sinnington., John, I. g. 1105 (10). Seon Reon, in O'Carroll's country, II. 1124. Sepuse, John Zapolski, count, waywode of Transylvania and claimant of the kingdom of Hungary ("King John"), II. 129, 471, 750. Seragoza. 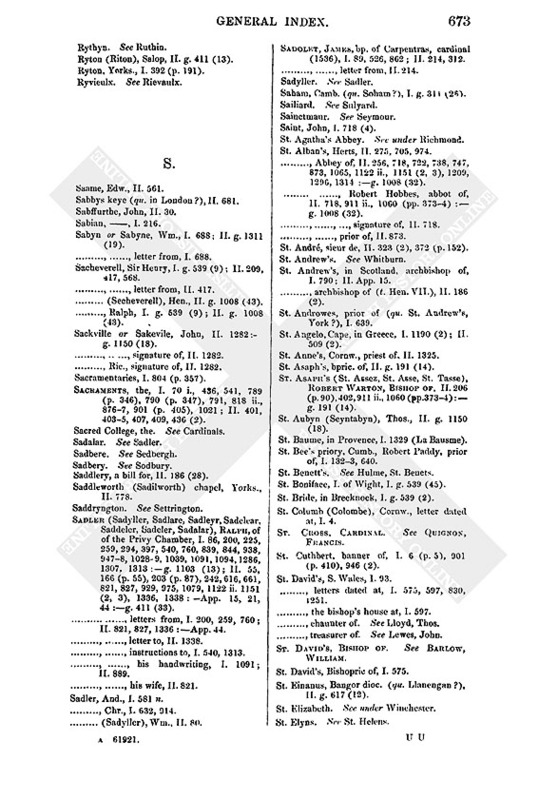 See Saragossa., John Zapolski, count, waywode of Transylvania and claimant of the kingdom of Hungary ("King John"), II. 129, 471, 750. Sercu (Sercus, Sircuys), sieur de, I. 826; II. 372. -,-, his son, II. 372. Sergeant or Sereaunt, Thos., I. 581, 581n. Serjeant foude (? ), I. 687 (p. 304). Serjeants at law, I. 1207 (21), 1227 (13). Serke. See Sark., I. 1207 (21), 1227 (13). Serls or Serles, Robert, vicar of St. Peter's in the East in Oxford, I. 79 (2), 127, 264. -,-, information against, I. 79 (2). Serne. See Cerne.-,-, information against, I. 79 (2). Serpentines and Serpentine powder, II. 343, 367. See also Ordnance. Sertall. See Shortall., II. 343, 367. See also Ordnance. Servaunt, Laurence, I. 1012, 1087 (pp. 496, 500). Servites, the, monastic order, prior-general of. See Laurerius, D.
Setbaurgh. See Sedbergh., the, monastic order, prior-general of. See Laurerius, D.
Sethage, Hants., II. g. 1311 (40). Settbirgh. See Sedbergh., Hants., II. g. 1311 (40). Settle or Settill, Thos., monk of Furness, I. 841 (3 ii. ), 842 (p. 373). Settle (Settyl) Spring, Yorks., I. 1034, 1087 (p. 496). Setton. See Seaton., Yorks., I. 1034, 1087 (p. 496). Settrington (Setterington, Saddryngton Sedryngton), Yorks., I. 174 (2), 201 (p. 92), 202 (p. 104), 369 (pp. 1656), 370 (p. 168), 402, 533 (p. 247), 534, 578 (p. 267), 683, 730 (2), 1023, 1199 (2), 1207 (8):g. 539 (25); II. 188, 248. -, church of, II. 188. -, rental of, II. 188. "Seven Sacraments," the term, II. 405. "Seven sheriffdoms," the, II. 6. Sever, Wm. bp. of Carlisle (14951502), II. 186 (1). Severn (Savern), the river, II. 393. Sewers, Commissioners of, II. 1153. Sewster, John, II. g. 1150 (41). Sexburghe, Kent, II. g. 1311 (16). -, Edmund, late mayor of Limerick, II. 281, 782, 1310 iii. Seyman, Robt., I. 1212 (13), 1284. Seymer. See Seamer., Robt., I. 1212 (13), 1284. Setmour, Jane, Queen (15367), I. 34, 126, 196, 354, 368, 450, 483, 494, 549, 586, 696 (p. 308), 709, 812, 816, 839 (2), 892, 924, 973, 1001, 1021 (5), 10689, 1099, 11645, 1175, 11878, 1225, 1247, 12667, 12734, 1284, 1323, 1325, 1327, App. 3:g. 311 (33), 795 (45); II. 11, 22, 34, 41, 47, 66, 77, 108, 130, 153, 228, 236, 242, 245, 2713, 275, 291 (p. 120), 298, 318, 329, 374, 424, 427, 430, 466, 474, 495, 521, 534 (2), 539, 6256, 661 (p. 241), 676, 680, 704, 711, 724, 760, 801, 808, 839, 88990, 893, 905, 911 (p. 320), 9223, 9705, 977, 988, 994, 1004, 1012, 1015, 1020, 1023, 1030, 1042, 1057 (3), 1060, 1067, 1075, 1077 (p. 380), 1084, 1102, 1105, 1121, 1127, 1143, 1147, 1151 (2), 1172, 1188, 1251, 1304, 1315n, 1343n:App. 9, 19, 46n:g. 191 (7), 411 (27), 617 (2), 1150 (44), 1311 (22). -,-, with child, I. 709, 816, 839 (2), 11645, 11878, 12667, 1325; II. 11, 22, 41, 47, 108, 374:App. 19. -,-, letters from, II. 153, 889. -,-, her almoner. See Aldridge, Robt. -,-, her brother. See Seymour, Sir Thos. -,-, her chamberlain. See Rutland, Thos. earl of. -,-, her chaplains, II. 894. -,-, her coronation. See Coronation. -,-, funeral of, II. 1012, 1023, 1060, 1105, 1251:App. 46n. -,-, her grandame, I. 1225. -,-, her surveyor, II. 1192. -,-, her vice - chamberlain. See Bainton, Sir Edw. -,-, her wardrobe, I. 354. Seymour (Semer), Sir Edward, viscount Beauchamp, brother of the Queen, earl of Hertford (18 Oct. 1537), I. 86, 246, 655, 806, 821, 846, 973, 1008, 1139, 1154, 1199, 1207 (20), 1225, 1227 (4), 1279; II. 77 (3), 97, 269, 398, 445, 555 (p. 210), 629, 714, 804, 881, 911 (pp. 31920), 921, 9389, 974, 101213:App. 7:g. 617 (1), 1008 (13, 22). -,-, letters from, II. 629, 1013. -,-, letter to, I. 1154. -,-, his chaplain, II. 629. -,-, signature of, I. 846. Seymour (Saymer, Semere, Seamowre, Semour), Sir Thomas, brother of the Queen (knighted 18 Oct. 1537), afterwards (1547) lord Seymour of Sudley, I. 457 (p. 220), 566, 602, 1188 (? ); II. 911 (pp. 31920), 939, 946, 973 v., ix., 1023. -,-, letter from, I. 602. Seymour (Sayntmor), Lady, mother of Sir Edward, II. 804. Seymour, Seymer, Seymore, Seamowre, &c., Elizabeth, widow of Sir Ant. Ughtred. See Ughtred, Eliz. -, Elizabeth, II. g. 1008 (13). -, Henry, II. 973 ix., 974, 975 bis. -, John, II. g. 1008 (13). -, Sir John, dec. II. g. 1008 (13). -, Margery, II. g. 1008 (13). -, Robert, letter from, II. 1117. -, Thomas, chaplain, II. 1049. -, Thomas, II. 1151 (2, 3). Seyn, the river, in Monmouthshire, I. g. 795 (23). Seyntabyn. See St. Aubyn., the river, in Monmouthshire, I. g. 795 (23). Seyntpoll. See St. Pol., Peter, II. 2. Seyton, Robert, I. g. 539 (26). Seyvell. See Savell., Robert, I. g. 539 (26). Sforza, Ascanio, Cardinal, I. 24 n.
Shackylles, Edm., II. g. 411 (21). Shaftesbury or Shafton, Dors., II. 195. Shaftowe, Cuthbert, II. 203 (p. 87). Shalbourn, Berks, II. g. 1008 (19). Shalfleet, I. of Wight, I. g. 539 (45); II. g. 1150 (7), 1311 (22). Shannon, the river in Ireland, II. 383 (p. 157). Shap (Shappe), Westmld., I. 843. -, abbey of, II. 205. Sharnefold (in Westham), Suss., II. g. 1008 (3). -, Rob., I. 895; II. 764:App. 43. -, (Sharp), Thomas, I. 957. Sharppeley, Nthld., I. 1103 (29). Shawe, Lancelot, I. 498 (2). -, Ric., I. 927, 941. -, Wm., I. 498 (2). Shaxton, Nich., bp. of Salisbury, I. 307, 746, 7556, 790 (p. 347), 1021 (3):g. 311 (14), 1105 (4); II. 52, 247, 4023, 593, 1114, 1277:App. 35:g. 1008 (34), 1150 (20, 21). -,-, letters from, II. 1114, 1277. -,-, letter to, I. 756. Sheep (muttons), I. 70 x., 201 (p. 90), 561, 901, 1035 (p. 474), 1087 (p. 500):g. 1105 (1, 5); II. 56, 88 (2), 141, 186 (13), 561, 682:g. 411 (31). Sheepshead (Shepeshed), Leic., I. g. 795 (38). Sheffield lodge, Yorks., letter dated at, II. 886, 954. Sheffield (Shefelde), John, abbot (late) of Beauchief, I. g. 1103 (19). Shehan (Shyeghan), David, II. 1340. Shelbrede. See Shulbred., David, II. 1340. Sheldon, Ralph, II. g. 411 (5). -, Wm., I. g. 539 (3). Shelfanger, Norf., I. g. 1103 (11). Shelfcobham, (Kent? ), II. 187 (6 ii). Shelford, Notts., I. g. 1105 (12); II. g. 1150 (32). -, John, son of Sir William, letter from, I. 740. -, Sir William, justice, I. 73840, 1227 (4); II. 1153, 1159, 1282:g. 1150 (19). -,-, letters from, I. 7389; II. 1282. -,-, his late wife, I. 739. Shellington and Shellington Hall, Nthld., I. g. 1103 (29). Shellow (Schellowe), Essex, II. g. 191 (40). Shelston, Lady, II. 973 v.
Shelton (Sheltun), Mrs., II. 1187. -, Sir John, I. 588, 1297; II. 87, 864. -, John, II. 665 (2), 974. See also Skelton. Shene, Surr., the Rose in, II. 186 (56). -, Charterhouse of, II. 1314 (1, 2). Shene, John, I. 581, 581 n.
Shenley (Shendley), letter dated at, II. 279. Shenshalleston, co. Meath, II. 1310 I. (10). Shenton, Salop, II. g. 411 (13). Shepcotes heath, Norf., I. 1056 (2). Shepherd (Cheparde), Mr., II. 1029. -, (Scheperd), Wm. II. 496. Sheplode, Norf., II. g. 1311 (30). Sheppey, Isle of, in Kent, II. g. 1150 (13), 1311 (16). Shepton Mallet, Soms., manor of, I. 2. -, parsonage of, I. 2. Sherard, Thos., II. 198:g. 1150 (18). Sherborne (Shirborne), Dors., II. g. 191 (47). Sherbourn (Sherborne) House Dham, I. 1025. Sherburn (Shirborn, Shyrbourn), Yorks., I. 174 (2), 392 (p. 191), 1207 (8). Sherdermarshe, II. 187 (6 ii.). Shere, John. See Launceston, prior of. Shereford (Shyrforthe), Norf., II. g. 1311 (30). Sheres or Sherys, Thos. II. g. 191 (31). Sheriff Hutton (Sheroffhoton, Sherefhetton, Shryfhoton, Shirefhoton, Sheroffhevton, Shrive of Hutton), Yorks., I. 185 (p. 80), 319, 416 (2), 870, 916, 1026 (? Shriff. ), 1043, 12377, 1246, 1269; II. 30, 82, 115, 186 (1), 203 (p. 87), 206, 229, 422 (2), 666, 696, 732, 915:App. 18:g. 191 (52). -, letters dated at, I. 449, 749, 942, 951, 982, 9912, 1024, 1037, 10589, 1064, 111214, 11567, 11723, 1185, 1207 (2), 121416, 12523, 1255, 1258, 1307; II. 9, 14, 23, 34, 35, 43, 53, 1001, 142, 159, 261, 2912, 345, 369, 422, 4301, 452, 547, 58890, 630, 650, 822, 828, 1077. -, castle of, I. 449, 930, 968; II. 69, 1076 (p. 379). -,-, keeper of. See Curwen, Sir Thos. -, park of, II. 206. Sheriff Roll, II. g. 1150 (18). Sherley. See Shirley., II. g. 1150 (18). Shernborne, Ric., II. 1101 (2). Shertell. See Shortall., Ric., II. 1101 (2). Sherwood (Shirwood), Notts., I. g. 311 (4). Sherwood (Shirwood), Dr., I. 786 ii., 1011 (p. 455). Sherys. See Sheres., Dr., I. 786 ii., 1011 (p. 455). Shewlton. See Skelton., Dr., I. 786 ii., 1011 (p. 455). Shingay (Shyngey), Camb., commandry of, I. 78, 207, 663 (la commanderie):g. 1103 (28). Shipdham, Norf., II. g. 1311 (30). -, Thos., II. 716 (2). Ships named:-, Wm., I. 1147. -,-, Anne, of Hayleforth, II. 1325. -,-, Anne, of Orwell, I. 418, 1117; II. 123. -,-, Anthony, II. g. 411 (21). -,-, Castelyn, II. 546 (or is this Castlyn's ship? See Castlyn). -,-, Cateryn Godeman, II. 469. -,-, Cateryn Graye, II. 469. -,-, Furtuskewys Bark, a pirate, I. 782. -,-, Garge (? ), of Ramsgate, I. 718 (3). -,-, Great Bark, II. 236. -,-, James, of London, I. 74. -,-, John Thailleur, II. 1262. -,-, Julian, of Hampton, I. 718. -,-, La Marchese, II. 320. -,-, Lion, I. 6567, 663, 718 (4). -,-, Mary Fortune, of Hull, I. 612. -,-, Mary Grace, II. 1136. -,-, Mary James, II. g. 191 (27, 42). -,-, Mary Walsingham, II. g. 191 (27, 42). -,-, Mawdelyn, of Thuro, II. 301, 1325. -,-, Minion (Mynyon), I. 528, 656 (Dudley's ship), 657, 663; II. 236. -,-, Pawncey, of Dieppe, II. 362. -,-, Santa Maria Desaie, I. 782. -,-, Sweepstake, I. 566, 6567, 663; II. 236. -,-, Savyor or Salvator, I. 233; II. 443, 606. -,-, Thomas, of Sandwich, I. 718 (2). -,-, Three Kings, a Biscayan, I. 412. -,-, Trinity, II. 443, 1057 (1, 3, 4), 1118. -, not named, I. 74, 392 (p. 188), 415, 445 (p. 215), 642, 817, 833, 1190, 1289; II. 208, 219, 225, 265, 416, 443, 758, 918, 1085. -,-, Arragonese (argosy), taken by the French in English water, I. 438, 566, 602; II. 1006. -,-, sent to Berwick, II. 69. -,-, coming from Bordeaux, I. 528, 873. -,-, Bretons, pirates, II. 208, 535, 556, 563, 613, 987. -,-, English, robbed in the Channel, I. 566, 656, 663; II. 149, 257, 556, 680. -,-, of Sir John Dudley, taken by Flemings, II. 574. -,-, passengers of Dover, II. 116, 121, 138, 257, 269, 297, 337. -,-, of the Easterlings, II. 850. -,-, taken in English water, I. 331, 358, 438, 752. -,-, Flemish, I. 331, 358, 364, 528, 562, 566, 6012, 611, 6567, 663, 718, 732, 752, 813, 866, 884, 924, 1292; II. 121, 297, 393, 454, 498, 644, 691, 850. -,-, Flemish (Flemings), depredations by, I. 718, 748, 10956. -,-, a Flemish pink, I. 528, 663. -,-, French, I. 331, 358, 364, 366, 438, 556 (p. 259), 566, 6012, 752, 1059, 12867; II. 362, 393, 4534, 471, 4812, 495, 498, 539, 595, 61213, 643, 670, 680, 691, 708, 759, 792, 801, 807, 832, 850, 868, 928, 1006, 1025, 1035. -,-, (of Boulogne), taken by Flemings, I. 611. -,-, (of Dieppe), at Falmouth, I. 277, 497. -,-, (of Honfleur), laden with brasil, taken by Flemings, I. 60, 358, 364, 562, 601, 656, 663, 718 (1, 4), 866, 924, 1168, 1293. -,-, (of St. Malo), I. 438 (p. 211); II. 613. -,-, in the Mediterranean, I. 347, 365. -,-, in Portugal, I. 565. -,-, men of war, I. 800; II. 116, 121, 149, 253, 257, 297. -, hoys taken by the French, II. 211, 223, 257, 336, 4812, 494. -, of Guernsey, II. 596, 606. -, Imperial, in the Mediterranean, I. 347, 365; II. 484 (others under Doria, &c.). -, Imperial men of war, I. 873. -, coming to Hull (going to the North), I. 81, 406, 849. -, Irish, II. 613, 743. -, the King's ships, I. 438 (p. 211), 457 (p. 220) 528, 566, 6012, 705, 718, 7612 (pp. 3334), 813, 843, 924; II. 269, 297, 337, 393, 535, 539, 556, 563, 577, 595, 670, 794, 1028:App. 19. -, the King's navy, I. 81516. -, of the Sieur de la Rochepot. See Rochepot. -, the Pope's galleys, II. 509 (2), 510. -, a picard coming from Cork, I. 782. -, Portuguese, I. 347, 800; II. 355, 362, 1199. -, Portuguese fleet for India, I. 772. -, Prizes, I. 528, 601. -, taken at Scarborough (detained in the North), I. 6 (pp. 6,8), 201 (pp. 901,99), 202, 370 (pp. 167, 16970), 848, 946 (2), 1087 (p. 497). -, Scotch, I. 762, 952, 1015, 1026, 12867. -, to convoy the king of Scots, I. 1107, 12867, 1307; II. 340, 422 (2), 431. -, Spanish and Biscayan, II. 393, 471, 556, 596, 606, 680, 694, 743, 759, 928. -, Spaniards at Falmouth, I. 277, 497. -, to take the king of Scots, I. 1094. -, of the Steelyard, II. 850. -, Turkish and Saracens, II. 320, 524, 598, 792, 1021, 1303. -, Turkish armada. See under Turks. -, Venetian, II. 484, 509 (2), 524, 598, 656, 725. -, hoys and ships laden with wood, wrecked or taken in France, II. 6089, 643, 830. Shipton, near Market Weighton, Yorks., I. 392 (p. 187). Shirborn. See Sherburn., near Market Weighton, Yorks., I. 392 (p. 187). Shirborne. See Sherborne., near Market Weighton, Yorks., I. 392 (p. 187). Shirebrook (Shirbroke), Derb., II. g. 1008 (9). Shirefhoton. See Sheriffhutton., Derb., II. g. 1008 (9). Shirley or Sherley, Sir Ric., signature of, II. 1282. -, Thos., II. g. 1311 (17). Shirwood. See Sherwood., Guillam, II. 192. Shitlington, Beds., II. g. 1150 (25). Shitilington (Nethershytlington), in Thornhill, Yorks., II. g. 191 (15). Shoebury grove, Essex, I. g. 1330 (58). Shoemakers, riotous assembly of, II. 275. Shokborough. See Shuckborough., riotous assembly of, II. 275. Sholder, Thos., I. 927, 941. Shooting, I., g. 311 (26), 1105 (4), 1330 (3); II. 191 (28), 617 (10). Shooting matches, I. 1125; II. g. 617 (10). Shoreham, Suss., II. g. 1311 (17). Shortall (Shertell, Sertall), lord, II. 837, 859 (3). -, (Sertall), Robt., II. 837 (2). -, (Sertall), Thos., II. 839 (2). Shotlond (qu. Scotland?, or Shetland? ), II. 431. Shottesham, Norf., II. g. 1311 (24). Shottylworth. See Shuttleworth., Norf., II. g. 1311 (24). Shouldham, Norf., II. g. 1311 (30). Shrewsbury (Shrowisbury, Salop, Screysbury), I. 679, 808; II. 835, 1299:g. 411 (13). -, letters dated at, II. 770, 775, 816, 896, 902, 927, 965, 985, 995, 9967, 1057 (1, 4), 1106, 1183, 1199, 1237. -, letter from the bailiffs, II. 956. -,-, abbot of, I. 744. -, castle of, I. g. 311 (30). -, gaol of, II. 1183. -, St. Julian's parish, I. 808. -, the Sceptre, I. 808. -, sign of the Lion at, I. 808. Shrewsbury, suffragan bishop of. See Thomas, Lewis. Shrewsbury, countess of, I. 169; II. 975. Shrewsbury and Waterford, George Talbot, earl of, Lord Steward, I. 6 (pp. 58), 21, 39, 502, 135, 154, 16970, 183, 208, 226, 247, 303 (p. 137), 306, 328, 334, 352, 380 (p. 177), 383 (p. 180), 392 (p. 190), 393, 424, 537, 583, 698, 744, 783, 849 (pp. 379, 382), 852, 854, 900 (p. 402), 944 (1, 2), 1000, 1022 (pp. 4645, 467), 1087 (p. 497), 1089 passim, 1106, 1175 ii., 1199, 1207 (20), 1227 (4), 1323:g. 539 (3, 9), 1104 (11), 1330 (59); II. 170, 172, (p. 57), 173, 186 (31, 40), 209, 234, 278, 299, 321 (2), 436, 503. 515, 538, 886, 911, 954, 989, 1151 (3), 1299 (p. 455), 1310 i. (18), ii. (2):App. 44:g. 191 (25, 36), 411 (13, 27), 1008 (8, 43), 1150 (11). -,-, letters from, I. 502, 16970, 183, 328; II. 170, 209, 278, 503, 954, 989. -,-, letters to, I. 39, 154, 226, 334, 352, 744. Shrive of Hutton. See Sheriffhutton.-,-, letters to, I. 39, 154, 226, 334, 352, 744. Shrofold, Kent, I. g. 1104 (6). Shropshire or Salop, I. 928:g. 795 (12), 1330 (55); II. 1314 (1, 2):g. 191 (50), 1150 (18), 1311 (37). -, sheriff of (15378). See Talbot, Sir John. Shrowsbury. See Shrewsbury.-, sheriff of (15378). See Talbot, Sir John. Shryne, baron of, II. 1310 i. (37). Shryne. See Scriven., baron of, II. 1310 i. (37). Shuckborough (Shokborough), Warw., I. g. 1330 (59). Shuckborough (Sokborowe), Humph., II. 518. Shulbred (Shelbrede or Shuldebrede), Suss., II. g. 1008 (19). -, priory (supp.) of, II. g. 1008 (19). -,-, Geo. Walden, prior of, II. g. 1008 (19). Shuttleworth (Shottylworth), Thos. or George, the abbot of, Sawley's servant, I. 218, 247, 4901. -,-, depositions of, I. 4901. Shyrforthe. See Shereford., Ralph, II. 374. Sicily (Sysill), I. 358 (p. 158), 562, 684, 762, 1144; II.31, 129, 509 (2), 656, 1137, 1217. Sicily, viceroy of, I. 122 (p. 59), 1144, 1190; II. 355. Sickesweke. See Siggeswick., viceroy of, I. 122 (p. 59), 1144, 1190; II. 355. Sidbury, Devon, I. g. 311 (15). Sidestrand (?Sydsterne), Norf., I. g. 1330 (26). Sidmonoton, (Sydnaunton), Hants, II. g. 1311 (22). -, Eliz., prioress of Rusper, II. g. 1311 (17). -, Fras., II. 975 bis. -, Sir Wm., I. 1159 iv., 1199 (4), 1227 (8,2), II. 172. Sidstern (qu. Sidestrand or Syderstone? ), Norf., I. g. 1330 (26). Sienna, I. 122 (p. 59), 526. Siffyn, co. Tipperary, II. 1310 i. (4). Siggeswick (Sigiswick, Sickesweke), Richard, I. 787, 789, 1035. Sigginstown (Sigenston, near Naas, co. Kildare, II. 1310 i. (11). Siknon, Linc., I. 581 n.
Silks and velvets, I. 925. Silkstone (Sylkston), Yorks., II. 186 (1). Silver, assay of, I. 1150. Silvester, Robert, prior of Gisburn, q. v.
Simcox (Symkox), Ralph, II. 496. Simonburn (Symonborne, Symeborne) castle, Nthld., I. 595:g. 1103 (29). Simonetta, Cardinal, I. 1189; II. 1227. Simpson (Symson), Dan., I. 1214 (2). -, Janet, I. 1214 (2). -, John, II. 1101 (2). -, Percy, I. 687 (p. 303). -, Wm., I. 141:g. 1103 (11). -, Wm., under-marshal of Calais, I. 417, App. 4; II. 453, 555 (p. 210), 1023. -,-, signature of, I. 417; II. 453. Sinningthwaite nunnery, Yorks., supp., II. 455 (1, 2), 548 (2). Sinnington (Senyngton), Yorks., I. 201 (p. 92), 202 (p. 104). Sion monastery, Midd, I. g. 1330 (54, 56); II. 33, 67, 291, 809, 952 (p. 333), 1314. -, letters dated at, II. 33, 67. -, Agnes, abbess of, I. g. 1330 (54, 56); II. 67 (my lady), 809. -, the father of. See Reynolds, Ric. Sircuys, Mons. See Sercu, Sieur de. Sisar park, (Lane.? ), I. 671 (2 ii). Sisewell, Suff., I. g. 1103 (11). Siston. See Syston., Yorks., II. 6. Skagelthorp. See Scaglethorpe., Linc., I. 592. Skalkeld. See Salkeld., Linc., I. 592. Skantwell, Piers, II. 837 (2). Skarburgh. See Scarborough., Piers, II. 837 (2). Skargill. See Scargill., Piers, II. 837 (2). -, John, II. 922, 1233. Skatternaghe, in Ireland, II. g. 411 (22). Skawsby. See Scawsby., in Ireland, II. g. 411 (22). Skeen (Schien), in Norway, II. 253. Skeffington, Dame Anne, letter from, I. 282. -, (Skevington), Leonard, I. 214; II. 582, 1218. -,-, letter from, I. 214. -, (Skevington), Sir Wm., dec., former deputy of Ireland, I. 282; II. 86, 486, 1310 ii. (2). Skelderscugh, Yorks., I. 979 ii. Skelton, Cumb., I. 687 (? Shewlton). Skelton, Yorks., II. 12 p. (5). Skelton, John, I. 121; II. 249 (6), 250 (1 ii.). -,-, letter to, I. 121. -, (Skelton), John, of Branthwaite (Bramweyth), I. 687 (p. 301); II. 248, 249 (6), 250 (1 ii.). -, Ralph, I. 535; II. 12 (2). Skenchius, Fredericus, II. 1116, 1227. Skerne, Mr., I. 995, 1040; II. 272, 298. -,-, his wife, II. 272. Skernyng. See Scarning.-,-, his wife, II. 272. Skerys, monastery of, I. 1278. Sketryke, in Ireland, II. 1097. Skevington. See Skeffington., in Ireland, II. 1097. -, John, II. g. 1008 (31). Skeypton. See Skipton.-, John, II. g. 1008 (31). -, (Skynner), Walt., I. 457 (p. 220). Skipp or Skippe, Dr. John, afterwards Bishop of Hereford, II. 911 ii., 1122 (p. 393), 1151 (2, 3). -,-, letter from, II. 120. 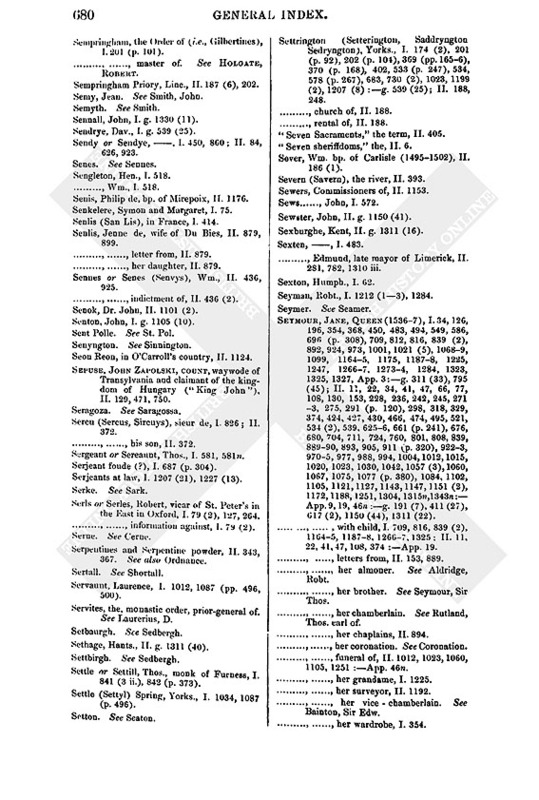 (See Errata). Skipp, Wm., archd. of Dorset, II. 402. Skipton (Skeypton), Yorks., I. 6 ii., 185. -, castle of, I. 7 (p. 10), 698 (3), 1186. -,-, letters dated, I. 712, 614, 792, 8823, 993. -, vicar of, I. 1186. Skipwith, Yorks., I. 380 (p. 178). Skipwith, Mr., I. 481 (p. 228). -, Edw., I. 734 (8), 1207 (7). -, Sir Wm., I. 380 (pp. 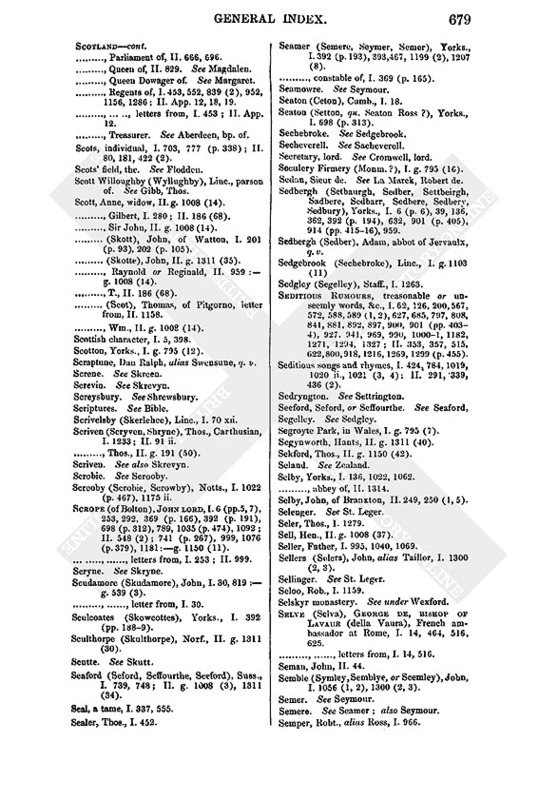 1757), 392 (p. 185), 734 (8); II. g. 1150 (43). -, (Skipworth), Wm., I. 734 (8). Skott. See Scott.-, (Skipworth), Wm., I. 734 (8). Skotteskewe Park, beside Middleham, I. 1326. Skowcottes. See Sculcoates., beside Middleham, I. 1326. Skreen (Screne), co. Meath, II. 1310 i. (4). Skreven (Screven), , II. 574. Skrevyn (Skryven, Screvin), Thos., of Calais, mayor (15378), I. 238, 354; II. 236, 831, 1221, 1233, 1280. -,-, letter from, II. 1280. Skrevyn. See also Scriven.-,-, letter from, II. 1280. Skrymsher, Thos., I. 1227 (11). Skryne (Skryn, Scryne), Martin, II. 486, 1310 i. (2). Skudamore. See Scudamore., Scryne), Martin, II. 486, 1310 i. (2). Skulthorpe. See Sculthorpe., Scryne), Martin, II. 486, 1310 i. (2). Skupholme, George. I. 734 (2). Skut (Scutte), , I. 196, 238, 354, 1149, 1240, 1267; II. 130. -,-, his wife, II. 130. -, (Scutte), John, Queen's tailor, II. 2, 172 (p. 57). Skye, Thos., II. g. 191 (27). Slade, Ric., II. 1208 (2). Slamesey, Slamondesey or Slampsey, Essex, II. g. 191 (40). Slane, in Ireland, II. 729 (5). -, baron of, I. 1066; II. 76, 383 (p. 157), 1046, 1288. Slaughterford, Wilts., II. g. 617 (1). Sleaford (Sleford, Slyfford, Slefford), Linc., I. 380 (p. 177), 576, 677, 1012 (4), 1087 (pp. 5001), 1207 (6, 11, 12, 15), 1213; II. 141, 187 (1, 4, 5, 6). -, letters dated at, I. 1193; II. 186 (33), 489. -, bailey of, I. 1088 iii. -, bp. of Lincoln's castle at, I. 380 (p. 177). -, mills at, II. 141 (? at S.). Slebbech, Pembrokesh., commandry of St. John at, II. 355. Sledale (Sleddall), Robert, I. 914, 965 (2). Sledewisshe, Dham., II. g. 191 (13). Sleforde, Hugh, I. 581, 581 n.
Slegge, Edw., II. 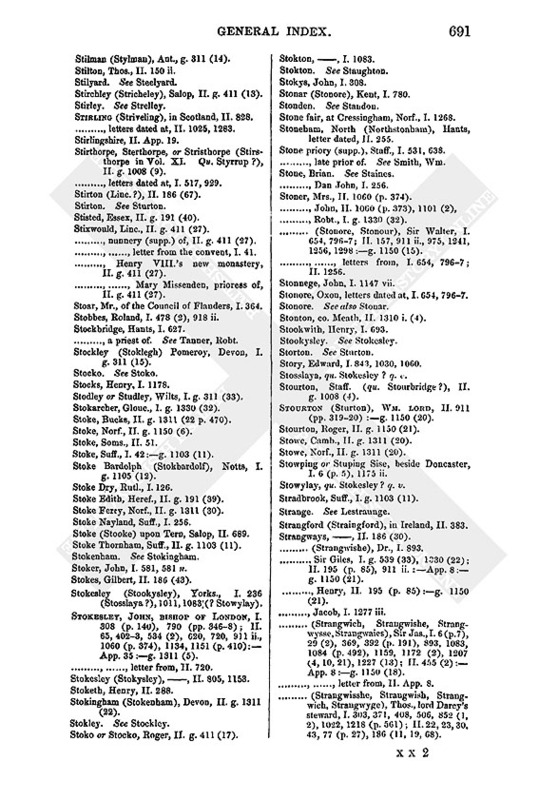 1060 (p. 373):g. 1150 (22). Sleggar, lord, II. 859 (3). Slendon. See Slindon., lord, II. 859 (3). Slevoyn, co. Tipperary, II. 1310 i. (24). Slewarde (qu. Slewardagh, co. Tipperary? ), II. 837 (2). Slews. See Sluys., co. Tipperary? ), II. 837 (2). Slindon (Slendon), Suss., letter dated at, II. 119. Slingsby or Slingesby, Mr., II. 186 (4). -, Robert, I. 201 (p. 95). -, (Slyngysby), Thos., I. 184, 848, 1087 (p. 497); II. 918, 1076. -,-, letters to, I. 184, 848. Slougham, Suss., II. g. 1311 (17). Sluse. See Sluys., Suss., II. g. 1311 (17). Sluyse (Slews, Sclews, Slewys, Sluse, Scluse, Slewse), in the Netherlands, I. 718 (pp. 31819); II. 709. -, Admiral of (or of Flanders), I. 601 (p. 276), 656, 663, 718 (1, 2, 3, 4), 752 (Imperial admiral), 866, 924, 1181 (p. 543). See also Jopp. Slyfford. See Sleaford.-, Admiral of (or of Flanders), I. 601 (p. 276), 656, 663, 718 (1, 2, 3, 4), 752 (Imperial admiral), 866, 924, 1181 (p. 543). See also Jopp. Slymagre, in Ireland (qu. Slawmargy? ), II. 837. Slythurst, Wm., I. g. 311 (25). Smalcalde. (Schmalkalden), in Saxony, letters dated at, I. 541, 564. -, Diet of the Protestant princes at (in 1537), I. 406, 541, 564; II. 32, 969, 1089. -,-, Emperor's ambassador to. See Eldo, Matthias. -,-, Pope's nuncio to, reply to, I. 564 (2); II. 1089. Smalcaldic League, the. letter from, I. 745. Small-pox, I. 1284; II. 186 (39). Smardale, Westmld., I. 498 (2). Smart, John. See Wigmore, abbot of. Smeton, Mark (executed 1536), II. 181 (p. 60). Smetoune Hall, Essex, I. g. 795 (8). Smite, Jehan. See Smithe, John. Smith (Smythe), Dr., of Oxford. See below Smith, Dr. Ric. -, , of Cottingham, I. 392 (p. 186). -, , of the Exchequer, II. 105, 126, 130, 166, 256, 285. -, Mr., the Queen's surveyor, II. 1192. -, Mrs., II. 973 iv., 1060 (p. 374). -, Chr., I. 498 (2), 1214 (2), 1246 (2). -, Francis, I. g. 1330 (14). -, George, I. 1207 (13):g. 539 (38); II. 186 (43), 696. -, Gilbert, archd. of Northampton, I. g. 1105 (11). -, Henry, I. 617, 1062. -,-, letter to, I. 617. -, (Semyth, Semy, Jehan Chemyn, Smite), John, lord Lisle's servant, ("Jensemy,") I. 117, 11920, 2401, 363, 3756, 487, 599, 658, 672, 955, 1209. 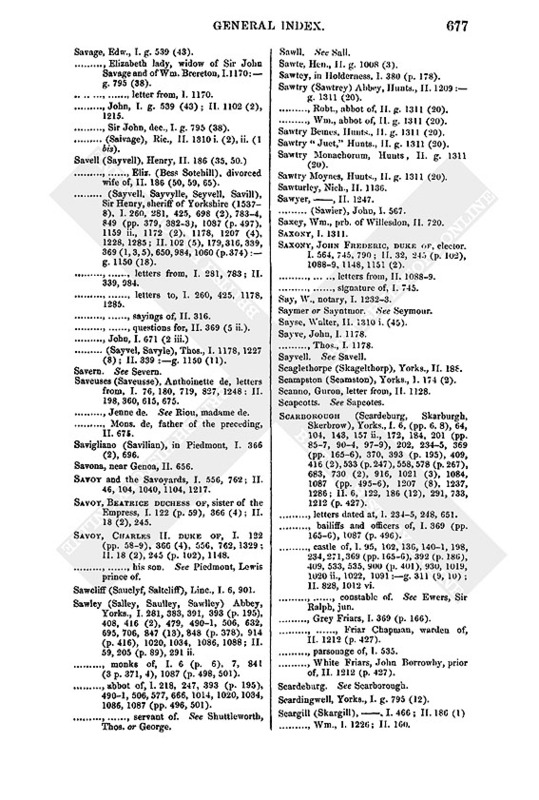 -, John, bailey of Grantham, I. 199. -, John, I. 380, 423, 498 (2), 578, 581, 581 n., 630, 1214 (2):g. 539 (4). 1103(3); II.56, 68, 1147, 1342:g. 1150 (18). -,-, examination of, I. 578, 630. -, John, of Kilkenny, II. 859. -, Mary, I. g. 1330 (14). -, Dr. Ric., of Oxford, master of Whittington College, I. 211, 264; II. 4023, 534, 621. -, Ric., I. 795 (40), 1330 (21). -, Robt., I. 406, 498 (2):g. 539 (11, 12); II. 44. -, (Smits), Rye, of Oye, II. 24. -, Thos., I. 581 bis, 581 n. bis, 693, 1207 (13):g. 795 (1); II. 1103(2):g. 1008 (42), 1311 (31). -, Sir Walter, II. 570. -, Wm., priest, I. 126. -, Wm., prior of Stone, I. 531, 638. -, Wm., I. 581 ii. bis, 849 (p. 383), 1300 (2):g. 1103 (2); II. g. 411 (1). Smithister (Smythister), Wm., I. 632. Smithson (Smythson, Smytheson), John, I. 581, 581 n.
Smits. See Smith., Smytheson), John, I. 581, 581 n.
Smorethwayt or Sumrthwayte, Wm., I. 478 (2), 918 ii. Smothing, , of Beverley, I. 1019, 1020 ii. 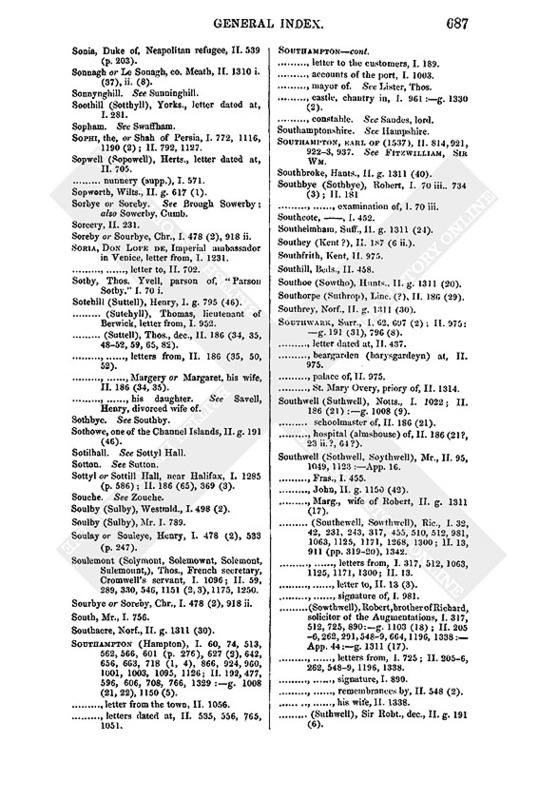 Smytheley, , of Brantingham, I. 392 (p. 185). Snaith (Snathe, Snethe), Yorks., I. 349, 666, 852 ii., 853, 918; II. 186 (1). -, bailey of, I. 201 (pp. 86, 93), 202 (pp. 103, 105), 370 (p. 168), 698 (p. 312). Snapdaughe, Nthld., I. g. 1103 (29). Snape, Suff., I. g. 1103 (11); II. 248 (p. 104). Snape, Yorks., I. 173, 1012 (p. 456). -, letter dated at, I. 913. Snathe. See Snaith., Robt., II. 1119. Snede, Dr., vicar of Rye, letter to, II. 1054. -, (Sneyde), Ric., I. 958, 1110. -,-, letter from, I. 1110. Snell, John, II. g. 796 (14). Snelland (Snellone), Line, parson of. See Ratforde, Thos. Snoring, Little, Norf., II. g. 1311 (30). Soberton (Subberton, Superton, Sobberton), Hants., I. 921; II. 166, 120910, 1273 (p. 446). -, letter dated at, I. 548. Sobjeta. See Sovieta.-, letter dated at, I. 548. Sochyners. See Swiss.-, letter dated at, I. 548. Sockburn (Sokbourne), Dham., II. 1212 (p. 428). Soda, John, apothecary, I. g. 311 (32). Sodbury (Sadbery), Glouc., II. 427. Soham (Saham), Camb., I. g. 311 (26). Sokbourne. 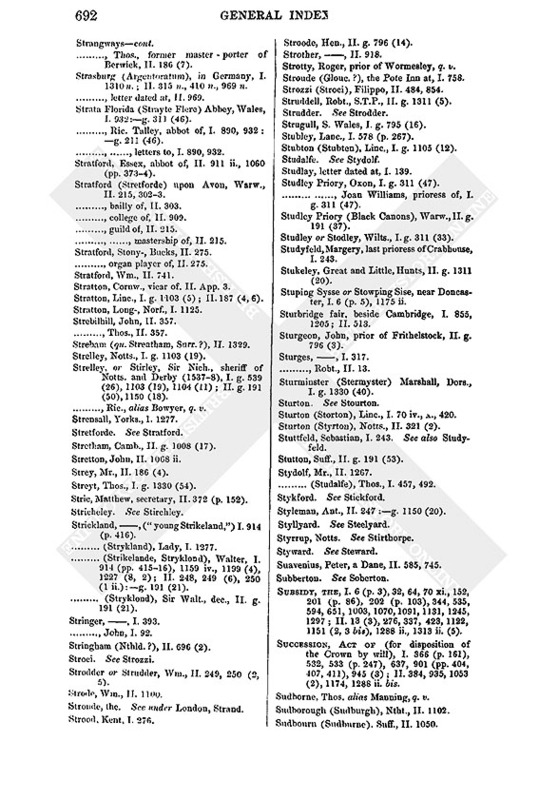 See Sockburn., Camb., I. g. 311 (26). Solemont or Solemownt. See Soulemont., Camb., I. g. 311 (26). Solicitor, Mr., II. 186 (4). Solway, the, II. 203 (the water). Solyman II., the Grand Turk. See under Turks. Solymont. See Soulemont., the Grand Turk. See under Turks. Sombourn (Soneburne) park, Hants, I. 87. Somersby, Linc., II. g. 411 (29). Somerset, Eleanor duchess of (temp Hen. VI. ), her lands, II. g. 191 (6, 8). Somerset, Duke of. See Richmond and Somerset. Somerset herald. See Treheron, Thomas. Somerset, Sir George, II. 911 ii.:g. 1150 (42). Somersetshire, I. 548; II. 195, 875, 975, 1314 (1, 2):g. 1150 (18). -, lesser monasteries in, I. 4. -, (and Dors.) sheriff of (15378). See Horsey, Sir John. Somerton, Oxon, letter dated at, I. 518. Somerton, Soms., II. g. 1311 (22). Somme, the French river, II. 680. Soneburne. See Somebourn., the French river, II. 680. Sonia, Duke of, Neapolitan refugee, II. 539 (p. 203). Sonnagh or Le Sonagh, co. Meath, II. 1310 i (37), ii. (8). Sonnynghill. See. Sunninghill., co. Meath, II. 1310 i (37), ii. (8). Soothill (Sotthyll), Yorks., letter dated at, I.281. Sopham. See Swaffham., Yorks., letter dated at, I.281. Sophi, the, or Shah of Persia, I. 772, 1116, 1190 (2); II. 792, 1127. Sopwell (Sopewell), Herts., letter dated at, II. 705. -, nunnery (supp. ), I. 571. Sopworth, Wilts., II. g. 617 (1). Sorbye or Soreby. See Brough. Sowerby; also Sowerby, Cumb. Soreby or Sourbye, Chr., I. 478 (2), 918 ii. Soria, Don Lope de, Imperial ambassador in Venice, letter from, I. 1231. -,-, letter to, II. 702. Sotby, Thos. Yvell, parson of, "Parson Sotby," I. 70 i.
Sotehill (Suttell), Henry, I. g. 795 (46). -, (Sutehyll), Thomas, lieutenant of Berwick, letter from, I. 952. -, (Suttell), Thos., dec., II. 186 (34, 35, 4852, 59, 65, 82). -,-, letters from, II. 186 (35, 50, 52). -,-, Margery or Margaret, his wife, II. 186 (34, 35). -,-, his daughter. See Savell, Henry, divorced wife of. Sothbye. See Southby.-,-, his daughter. See Savell, Henry, divorced wife of. Sothowe, one of the Channel Islands, II. g. 191 (46). Sotilhall. See Sottyl Hall., one of the Channel Islands, II. g. 191 (46). Sotton. See Sutton., one of the Channel Islands, II. g. 191 (46). Sottyl or Sottill Hall, near Halifax, I. 1285 (p. 586); II. 186 (65), 369 (3). Souche. See Zouche., near Halifax, I. 1285 (p. 586); II. 186 (65), 369 (3). Soulby (Sulby), Westmld., I. 498 (2). Soulby (Sulby), Mr. I. 789. Soulay or Souleye, Henry, I. 478 (2), 533 (p. 247). Soulemont (Solymont, Solemownt, Solemont, Sulemount,), Thos., French secretary, Cromwell's servant, I. 1096; II. 59, 289, 330, 546, 1151 (2, 3), 1175, 1250. Sourbye or Soreby, Chr., I. 478 (2), 918 ii. Southacre, Norf., II. g. 1311 (30). Southampton (Hampton), I. 60, 74, 513, 562, 566, 601, (p. 276), 627 (2), 642, 656, 663, 718 (1, 4), 866, 924, 960, 1001, 1003, 1095, 1126; II. 192, 477, 596, 606, 708, 766, 1329:g. 1008 (21, 22), 1150(5). -, letter from the town, II. 1056. -, letters dated at, II. 535, 556, 765, 1051. -, letter to the customers, I. 189. -, accounts of the port, I. 1003. -, mayor of. See. Lister, Thos. -, castle, chantry in, I. 961:g. 1330 (2). -, constable. See Sandes, lord. Southamptonshire. See Hampshire.-, constable. See Sandes, lord. Southampton, earl of (1537), II. 814, 921, 9223, 937. See.Fitzwilliam, Sir Wm. Southbroke, Hants., II. g. 131 (40). Southbye (Sothbye), Robert, I. 70 iii. 734 (3); II. 181. -,-, examination of, I. 70 iii. Southelmham, Suff., II. g. 1311 (24). Southey (Kent? ), II. 187 (6 ii.). Southoe (Sowtho), Hunts., II. g. 1311 (20). Southorpe (Suthrop), Line. (? ), II. 186 (29). Southrey, Norf., II. g. 1311 (30). Southwark, Surr., I. 62, 697 (2); II. 975:g. 191 (31), 796(8). -, letter dated at, II. 437. -, beargarden (barysgardeyn) at, II. 975. -, palace of, II. 975. -, St. Mary Overy, priory of, II. 1314. Southwell (Suthwell), Notts., I. 1022; II. 186 (21):g. 1008 (9). -, schoolmaster of, II. 186 (21). -, hospital (almshouse) of, II. 186 (21?, 23 ii. ?, 64?). Southwell (Sothwell, Soythwell), Mr., II. 95, 1049, 1123:App. 16. -, John, II. g. 1150 (42). -, Marg., wife of Robert, II. g. 1311 (17). -, (Southewell, Sowthwell), Ric, I. 32, 42, 231, 243, 317, 455, 510, 512, 981, 1063, 1125, 1171, 1268, 1300; II. 13, 911 (pp. 31920), 1342. -,-, letters from, I. 317, 512, 1063, 1125, 1171, 1300; II. 13. -,-, letter to, II. 13 (3). -,-, signature of, I. 981. -, (Sowthwell), Robert, brother of Richard, solicitor of the Augmentations, I. 317, 512, 725, 890:g. 1103 (18); II. 2056, 262, 291, 5489, 664, 1196, 1338:App. 44:g. 1311 (17). -,-, letters from, I. 725; II. 2056, 262, 5489, 1196, 1338. -,-, remembrances by, II. 548 (2). -,-, his wife, II. 1338. -, (Suthwell), Sir., Robt, dec., II. g. 191 (6). Southwick, Hants, prior of, I. 995, 1040, 1069. Southwick, Ntht., II. g. 1311 (20). Southwold, Suff., I. g. 795 (39). Southwood, Wm., II. g, 411 (1). Southworth, George, petition of, I. 1093. 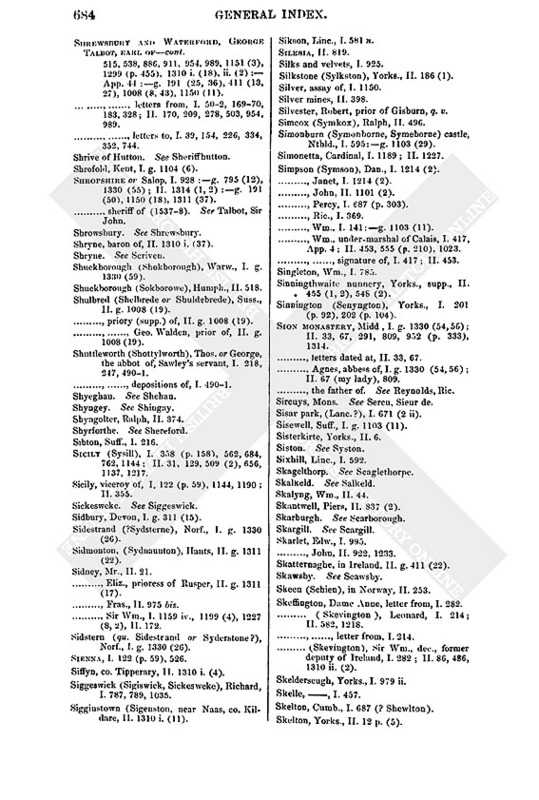 -, (Southeworthe, Suthwarthe), Sir Thos., I. 348, 518, 785. Soutton. See Sutton.-, (Southeworthe, Suthwarthe), Sir Thos., I. 348, 518, 785. Sovieta (Sobjeta), Domingo de, II. 443, 596, 606, 694, 716. -,-, his brother, II. 443. -, Francisco de, II. 596, 606, 694, 716. -, John Saunce de, II. 606. Sowerby (Soreby, Sowrebie), Cumb., I. 687 (pp. 300, 303); II. g. 191 (45). Sowerby (Sowrby), Yorks., letter dated at, II. 1268. Sowth. See South., Yorks., letter dated at, II. 1268. Sowthen, John, II. 1256 (2). Soythwell. See Southwell., I. 1277,. Spain (Spangna), I. 330, 347, 365, 562, 718, 7623, 873, 900 (p. 402), 949, 996, 1065, 1144, 1190, 1257, 1314; II. 46, 104, 129, 131, 148 n., 186 (62), 207, 212, 240, 245 (p. 102), 4434, 524, 640, 699, 701, 716, 743, 758, 843, 952 (p. 333), 1053, 1098, 1127 (p. 395), 1128 (p. 397), 1217 (p. 430), 1243, 1253, 1307. -, Papal nuncio in. See Guidiccion, Mons. -, the Cortez, II. 104. -, prelates and clergy of, II. 245 (p. 102), 701. Spain, prince of. See Philip. Spalding More, Yorks. See Holme in Spalding More. Spalding priory, Linc., II. 6, 1314. -, prior of, II. 2. -, Boston, former prior of, II. 2. Spalding, , I. 392 (p. 189). Spalley. See Salley., , I. 392 (p. 189). Spanby, Linc., a rental of, I. 1004. Spangna. See Spain., Linc., a rental of, I. 1004. Spaniards, individual, I. 718 (2); II. 471, 898 (8), 928, 1053 (2). Spanish soldiers (the Spaniards), I. 801; II. 509 (2), 730. Spanish soldiers, in Italy, I. 347, 625; II. 484, 539 (p. 203), 656, 1040, 1053. Sparke, Thos., S. T. B., bp. 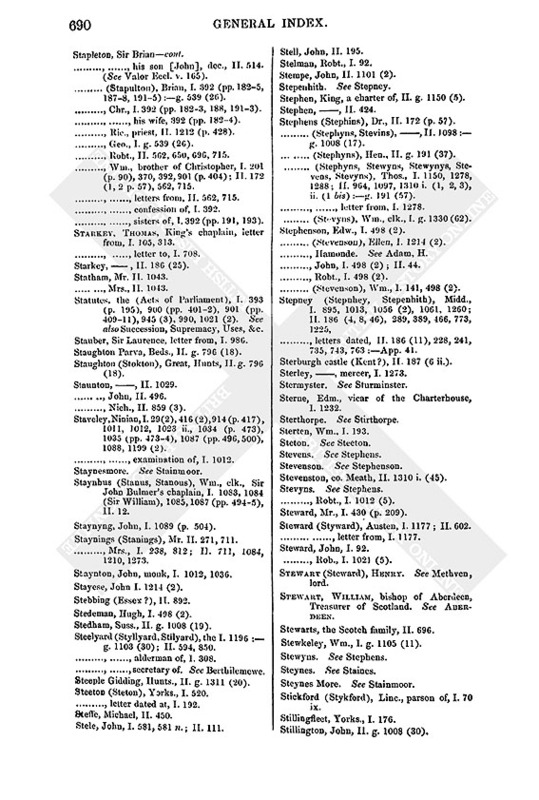 suffragan of Berwick, II. g. 191 (12). Sparling (Sperlyng), John, I. 581. Spayne, John, of Folkestone, I. 718 (2). Speake, Sir Thos., II. g. 1150 (18). Spears to form a body guard to the King, I. 299. Speenhamland (Spenamland), Berks., II. 1256 (2). Speir. See Spires., Berks., II. 1256 (2). Spelman (Spilman, Splyman), Sir John, justice, I. g. 311 (30), 795 (4), 1103 (18); II. 248 (p. 104), 1145:g. 191 (33), 1008 (31), 1150 (19, 41), 1311 (28). -,-, Eliz. his wife, I. g. 1103 (18). Spelsbury (Spillesbury), Oxon, I. g. 795 (15). Spenamland. See Speenhamland., Oxon, I. g. 795 (15). Spencer (Spenser), , I. 654, 661. -, John, I. 498 (2). -, Robt., I. 380 (p. 177). Spenymore, near Brancepath, I. 29, 1035 (pp. 4734). Sperlyng. See Sparling., near Brancepath, I. 29, 1035 (pp. 4734). Spertt, Sir Thos., I. 718 (4). -,-, his pinnace, I. 718 (4). Speryng, Comedus, I. g. 539 (11). Speyke, John, II. g. 191 (57). -, Thos., II. g. 191 (57). -, Wm., II. g. 191 (57). Spicer (Spycer), John, I. 346; II. 1325. Spillesbury. See Spelsbury., Mr. II. 84. Spilman. See Spelman., Mr. II. 84. Spilsby (Spillesby, Spylysbe), Linc., I. 581 ii., 581 n.
Spineth or Spinthe, Mr., I. 301. Spires (Speir), in Germany, II. 725. Spittels, near Scarborough, I. 369 (pp. 1656). Splyman. See Spelman., near Scarborough, I. 369 (pp. 1656). Spofforth, Yorks., I. 392 (p. 191). Spoils. See under Northern Rebellion., Yorks., I. 392 (p. 191). Sponer, Edm., I. 498 (2). -, Edw., vicar of Boughton-under-Blean, I. 1318. Spragen, Wm., abbot of Blanchland, I. g. 311 (36). 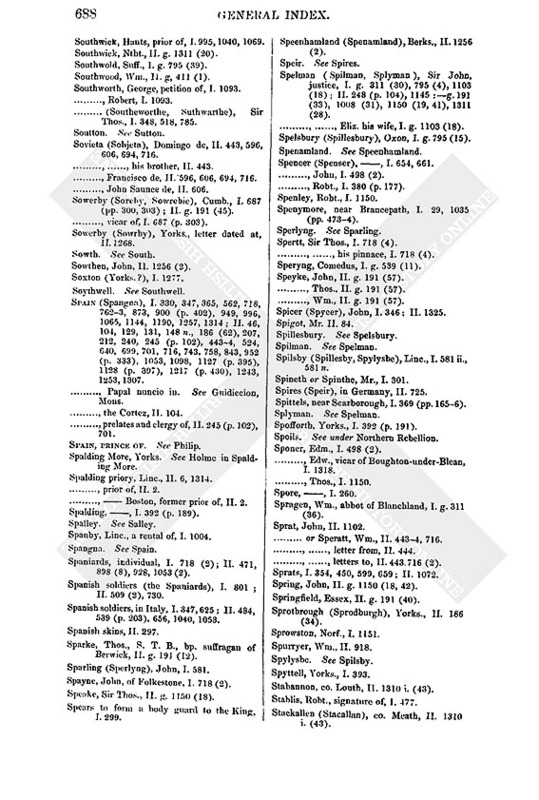 -, or Speratt, Wm., II. 4434, 716. -,-, letter from, II. 444. -,-, letters to, II. 443. 716 (2). Sprats, I. 354, 450, 599, 659; II. 1072. Spring, John, II. g. 1150 (18, 42). Springfield, Essex, II. g. 191 (40). Sprotbrough (Sprodburgh), Yorks., II. 186 (34). Spylysbe. See Spilsby., Wm., II. 918. Stabannon, co. Louth, II. 1310 i. (43). Stablis, Robt., signature of, I. 477. Stackallen (Stacallan), co. Meath, II. 1310 i. (43). Stackhouse, John, I. g. 1103 (31). -, letters dated at, I. 5834, 638, 1270; II. 611. -, castle of, I. 584:g. 311 (30); II. 622. -, gaol of, I. 193. -, St. Thomas' Priory beside, I. 81920, 973; II. 611:g. 411 (12). -,-, Richard Whyttewall, prior of, I. 973; II. 611:g. 411 (12). -,-, -, letter from, II. 611. Stafford, Archd. of. See Heath, Nich. -, Archdeaconry of, II. 502. Stafford, Henry lord, I. 5834, 638, 1270; II. 523, 1282, 1332. -,-, letters from, I. 5834, 638, 1270; II. 523. -,-, letters to, II. 1332. -,-, his children, II. 523. -,-, his daughter Susan, II. 1332. Stafford, Lady, wife of Lord Stafford, II. 1282. -, , I. 457 (p. 220), 585. -, Dorothy, d. of Lord Stafford, II. 1332. -, Hamond, II. 898 (5, 8), 1310 ii. (2). -, Sir Humph., I. 1207 (5, 12):g 539 (7); II. 1236. -,-, his son, II. 1236. -, John, I. 718 (3); II. 1120. -, Lady Mary (Anne Boleyn's sister), I. 822. 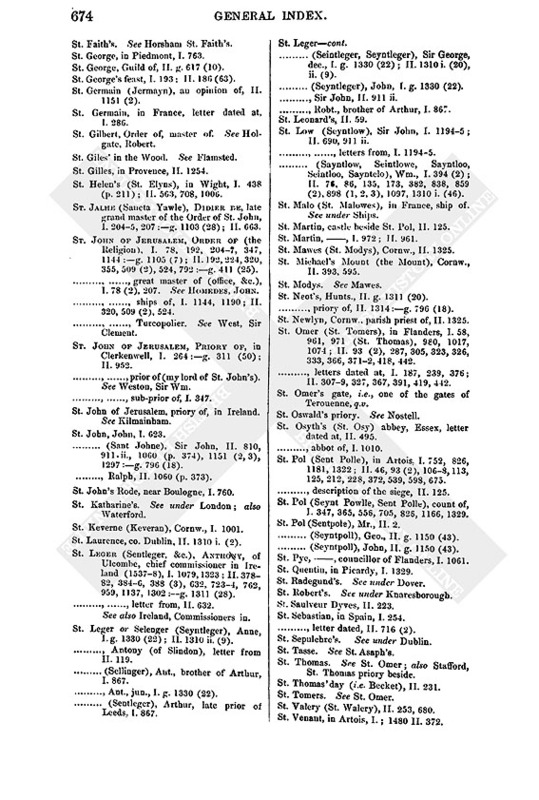 -, Patrick, sovereign of Wexford, I. 283. Staffordshire, I. 638:g. 1103 (20); II. 523, 568, 1314 (1, 2):App. 40:g. 1150 (18). -, sheriff of. See Greysley, Sir Geo. Staghuavyn, co. Dublin, II. 1310 i. (2). Staindrop (Stayndrope), Dham., I. 148. Staines (Steynes), Midd., II. g. 1311 (22 p. 470). -, letter dated, II. 579. Staines or Stanes (Stone), Brian, I. 70 ix., 734 (3), 1207 (11). -,-, examination of, I. 70 ix. -, George, I. 70 iii., iv., vii., viii., x.xii. -, John, of Beetham, I. 632, 671, 849 (pp. 381, 383), 878, 1088. -,-, his confession, I. 632. Stainmoor (Staynemore, Steynes More, Stanesmore), Westmld., I. 498 (2), 687 (1, 2). See also Austen More. Stainsby (Stansby), Derb., I. g. 795 (38). Slakehouse, John, I. 392 (p. 184). Stamelyn. See Stamullen., John, I. 392 (p. 184). Stamford (Stampforde, Stamforth, Stantfurd), Linc., I. 201 (p. 95), 380 (p. 178), 974, 979; II. 196, 975. -, letters dated at, I. 173, 677; II. 491. -, the George at, I. 979. Stamford Bridge, Yorks., I. 369 (p. 166). Stamullen (Stamelyn), co. Meath, II. 1310 i. (43). Standeforthe. See Sandford., Dyrycke, I. 308. Standen, in Clitheroe, Lanc., I. 633. Standlake, Oxon, II. g. 1008 (26). Standley. See Stanley., Oxon, II. g. 1008 (26). Standmere, Beds., letter dated, II. 783. Standon (Stonden), Herts., II. 975. Standon, Ric., prior of Hatfield Broadoak, II. 718. Stanes. See Staines., Ric., prior of Hatfield Broadoak, II. 718. Stanhoe, Norf., II. g. 1311 (30). Stanhope, Anne, II. 1150 (32). -, (Stannehop), Mich., I. g. 1104 (11), 1105 (12); II. 1150 (32). Stanhurste, Nich., I. 1310 i. (49), ii. (1 bis). Stanings. See Staynings., Nich., I. 1310 i. (49), ii. (1 bis). Stanion (Stanyerne), Ntht., II. 1102. Stanke, the, in Furness, I. 841 (2). Stanley, Wilts., I. g. 311 (33). -, Abbey (supp. ), I. g. 311 (33); II. 974. -,-, abbot of. See Morley, Thos. Stanley, Edward, letter from, I. 1321. -, (Standley), Jas., I. g. 1103 (30). -, (Standley), John, II. 475. -, Thos., priest, I. 849, 1089. -,-, letter from, cited, I. 849. -, (Stanely), Sir Wm., I. g. 539 (42); II. 58 ii.:g. 411 (9), 1150 (18). -, Wm., II. 58 ii. Stanlowe abbey, Chesh., cell to Whalley, inventory of goods, I. 958. Stansby. See Stainsby., Ric., I. 63. Stanstead, Essex, II. g. 191 (40). Stantfurd. See Stamford., Essex, II. g. 191 (40). Stanton Lacy, Salop, II. g. 1150 (17). Stanus. See Staynhus., Salop, II. g. 1150 (17). Stanway (Stanway), Glouc., letter dated at, II. 1304. Stanwell, Midd., I. g. 1311 (22 pp. 46970). Stanyerne. See Stanion., Midd., I. g. 1311 (22 pp. 46970). Stapelow, Beds., II. g. 796 (18). Stapleford Abbatis, Essex, I. g. 1104 (2); II. g. 191 (9). Staplehurst (Stapilherst), Kent, I. g. 311 (18); II. g. 1150 (31). Staplers. See under Calais, Staple. Stapleton, Sir Brian, I. g. 539 (26), 1104 (11); II. 268, 358, 451, 455, 474, 514, 1175 (p. 416):g. 1150 (24). -,-, letters from, II. 358, 451, 514. -,-, his son [John], dec., II. 514. (See Valor Eccl. v. 165). -, (Stapulton), Brian, I. 392 (pp. 1825, 1878, 1915):g. 539 (26). -, Chr., I. 392 (pp. 1823, 188, 1913). -,-, his wife, 392 (pp. 1824). -, Ric., priest, II. 1212 (p. 428). -, Geo., I. g. 539 (26). -, Robt., II. 562, 650, 696, 715. -, Wm., brother of Christopher, I. 201 (p. 90), 370, 392, 901 (p. 404); II. 172 (1, 2 p. 57), 562, 715. -,-, letters from, II. 562, 715. -,-, confession of, I. 392. -,-, sisters of, I. 392 (pp. 191, 193). Starkey, Thomas, King's chaplain, letter from, I. 105, 313. -,-, letter to, I. 708. Starkey, , II. 186 (25). Statutes, the (Acts of Parliament), I. 393 (p. 195), 900 (pp. 4012), 901 (pp. 40911), 945 (3), 990, 1021 (2). See also Succession, Supremacy, Uses, &c.
Stauber, Sir Laurence, letter from, I. 986. Staughton Parva, Beds., II. g. 796 (18). Staughton (Stokton), Great, Hunts, II. g. 796 (18). -, Nich., II. 859 (3). Staveley, Ninian, I. 29 (2), 416 (2), 914 (p. 417), 1011, 1012, 1023 ii., 1034 (p. 473), 1035 (pp. 4734), 1087 (pp. 496, 500), 1088, 1199 (2). -,-, examination of, I. 1012. Staynesmore. See Stainmoor.-,-, examination of, I. 1012. Staynbus (Stanus, Stanous), Wm., clk., Sir John Bulmer's chaplain, I. 1083, 1084 (Sir William), 1085, 1087 (pp. 4945), II. 12. Staynyng, John, I. 1089 (p. 504). Staynings (Stanings), Mr. II. 271, 711. -, Mrs., I. 238, 812; II. 711, 1084, 1210, 1273. Staynton, John, monk, I. 1012, 1036. Stayese, John I. 1214 (2). Stedeman, Hugh, I. 498 (2). Stedham, Suss., II. g. 1008 (19). Steelyard (Styllyard, Stilyard), the I. 1196:g. 1103 (30); II. 594, 850. -,-, alderman of, I. 308. -,-, secretary of. See Berthilemewe. Steeple Gidding, Hunts., II. g. 1311 (20). Steeton (Steton), Yorks., I. 520. -, letter dated at, I. 192. Stele, John, I. 581, 581 n.; II. 111. Stempe, John, II. 1101 (2). Stepenhith. See Stepney., John, II. 1101 (2). Stephen, King, a charter of, II. g. 1150 (5). Stephens (Stephins), Dr., II. 172 (p. 57). -, (Stephyns, Stevins), , II. 1098:g. 1008 (17). -, (Stephyns), Hen., II. g. 191 (37). -, (Stephyns, Stewyns, Stewynys, Stevens, Stevyns), Thos., I. 1150, 1278, 1288; II. 964, 1097, 1310 i. (1, 2, 3), ii. (1 bis):g. 191 (57). -,-, letter from, I. 1278. -, (Stevyns), Wm., clk., I. g. 1330 (62). Stephenson, Edw., I. 498 (2). -, (Stevenson), Ellen, I. 1214 (2). -, Hamonde. See Adam, H.
-, John, I. 498 (2); II. 44. -, Robt., I. 498 (2). -, (Stevenson), Wm., I. 141, 498 (2). Stepney (Stepnhey, Stepenhith), Midd., I. 895, 1013, 1056 (2), 1061, 1260; II. 186 (4, 8, 46), 289, 389, 466, 773, 1225,. -, letters dated, II. 186 (11), 228, 241, 735, 743, 763:App. 41. Sterburgh castle (Kent? ), II. 187 (6 ii.). Sterley, , mercer, I. 1273. Stermyster. See Sturminster., , mercer, I. 1273. Sterne, Edm., vicar of the Charterhouse, I. 1232. Sterthorpe. See Stirthorpe., Edm., vicar of the Charterhouse, I. 1232. Steton. See Steeton., Wm., I. 193. Stevens. See Stephens., Wm., I. 193. Stevenson. See Stephenson., Wm., I. 193. Stevenston, co. Meath, II. 1310 i. (45). Stevyns. See Stephens., co. Meath, II. 1310 i. (45). -, Robt., I. 1012 (5). Steward, Mr., I. 430 (p. 209). Steward (Styward), Austen, I. 1177; II. 602. -,-, letter from, I. 1177. -, Rob., I. 1021 (5). Stewart (Steward), Henry. See Methven, lord. S tewart, William, bishop of Aberdeen, Treasurer of Scotland. See Aberdeen. Stewarts, the Scotch family, II. 696. Stewkeley, Wm., I. g. 1105 (11). Stewyns. See Stephens., Wm., I. g. 1105 (11). Steynes. See Staines., Wm., I. g. 1105 (11). Steynes More. See Stainmoor., Wm., I. g. 1105 (11). 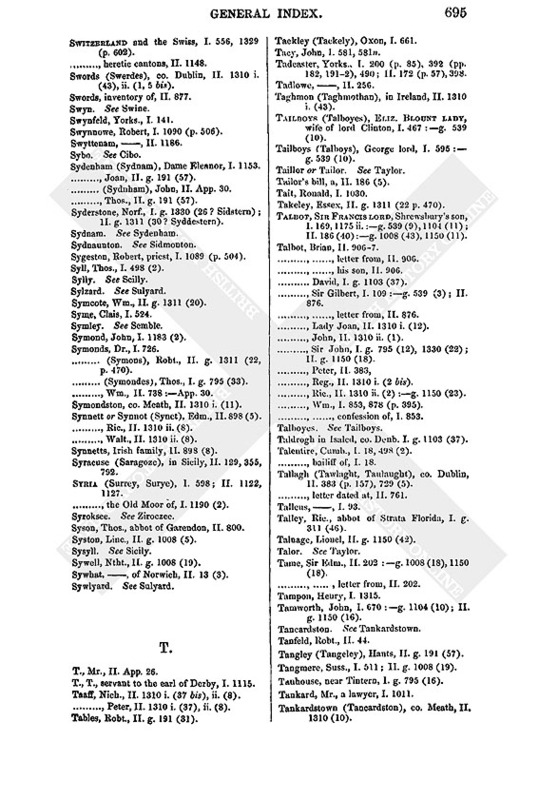 Stickford (Stykford), Linc., parson of, I. 70 ix. Stillington, John, II. g. 1008 (30). Stilman (Stylman), Ant., g. 311 (14). Stilton, Thos., II. 150 ii. Stilyard. See Steelyard., Thos., II. 150 ii. Stirchley (Stricheley), Salop, II. g. 411 (13). Stirley. See Strelley., Salop, II. g. 411 (13). Stirling (Striveling), in Scotland, II. 828. -, letters dated at, II. 1025, 1283. Stirthorpe, Sterthorpe, or Stristhorpe (Stirsthorpe in Vol. XI. Qu. Styrrup? ), II. g. 1008 (9). -, letters dated at, I. 517, 929. Stirton (Linc.? ), II. 186 (67). Stirton. See Sturton., II. 186 (67). Stisted, Essex, II. g. 191 (40). Stixwould, Linc., II. g. 411 (27). -, nunnery (supp.) of, II. g. 411 (27). -,-, letter from the convent, I. 41. -, Henry VIII. 's new monastery, II. g. 411 (27). -,-, Mary Missenden, prioress of, II. g. 411 (27). Stoar, Mr., of the Council of Flanders, I. 364. Stobbes, Roland, I. 478 (2), 918 ii. -, a priest of. See Tanner, Robt. Stockley (Stoklegh) Pomeroy, Devon, I. g. 311 (15). Stocko. See Stoko., Devon, I. g. 311 (15). 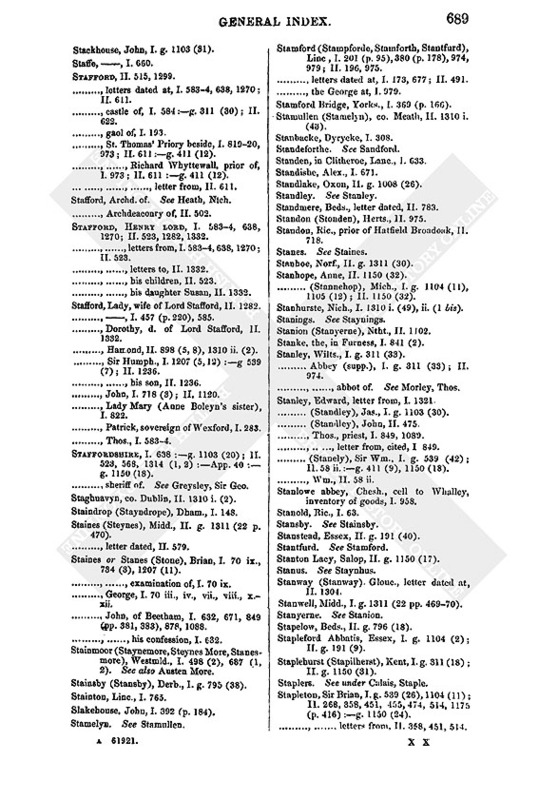 Stodley or Studley, Wilts, I. g. 311 (33). Stokarcher, Glouc., I. g. 1330 (32). Stoke, Bucks, II. g. 1311 (22 p. 470). Stoke, Norf., II. g. 1150 (6). Stoke, Suff., I. 42:g. 1103 (11). Stoke Bardolph (Stokbardolf), Notts, I. g. 1105 (12). Stoke Dry, Rutl., I. 126. Stoke Edith, Heref., II. g. 191 (39). Stoke Ferry, Norf., II. g. 1311 (30). Stoke Nayland, Suff., I. 256. Stoke (Stooke) upon Tern, Salop, II. 689. Stoke Thornham, Suff., II. g. 1103 (11). Stoker, John, I. 581, 581 n.
Stokes, Gilbert, II. 186 (43). Stokesley (Stookysley), Yorks., I. 236 (Stosslaya? ), 1011, 1083 (? Stowylay). Stokesley, John, bishop of London, I. 308 (p. 140), 790 (pp. 3468); II. 65, 4023, 534 (2), 620, 720, 911 ii., 1060 (p. 374), 1134, 1151 (p. 410):App. 35:g. 1311 (5). -,-, letter from, II. 720. Stokesley (Stokysley), , II. 805, 1153. Stokingham (Stokenham), Devon, II. g. 1311 (22). Stokley. See Stockley., Devon, II. g. 1311 (22). Stoko or Stocko, Roger, II. g. 411 (17). Stokton. See Staughton., , I. 1083. Stonar (Stonore), Kent, I. 780. Stonden. See Standon., Kent, I. 780. Stone fair, at Cressingham, Norf., I. 1268. Stoneham, North (Northstonham), Hants, letter dated, II. 255. Stone priory (supp. ), Staff., I. 531, 638. -, late prior of. See Smith, Wm. -, Dan John, I. 256. Stoner, Mrs., II. 1060 (p. 374). -, John, II. 1060 (p. 373), 1101 (2), . -, Robt., I. g. 1330 (32). -, (Stonore, Stonour), Sir Walter, I. 654, 7967; II. 157, 911 ii., 975, 1241, 1256, 1298:g. 1150 (15). -,-, letters from, I. 654, 7967; II. 1256. Stonnege, John, I. 1147 vii. Stonore, Oxon, letters dated at, I. 654, 7967. Stonore. See also Stonar., Oxon, letters dated at, I. 654, 7967. Stonton, co. Meath, II. 1310 i. (4). Stookysley. See Stokesley., Henry, I. 693. Storton. See Sturton., Henry, I. 693. Story, Edward, I. 843, 1030, 1060. Stosslaya, qu. Stokesley? q. v.
Stourton, Staff. (qu. Stourbridge? ), II. g. 1008 (4). Stourton (Sturton), Wm. lord, II. 911 (pp. 31920):g. 1150 (20). Stourton, Roger, II. g. 1150 (21). Stowe, Camb., II. g. 1311 (20). Stowe, Norf., II. g. 1311 (20). Stowping or Stuping Sise, beside Doncaster, I. 6 (p. 5), 1175 ii. Stowylay, qu. Stokesley? q. v.
Stradbrook, Suff., I. g. 1103 (11). Strange. See Lestraunge., Suff., I. g. 1103 (11). Strangford (Straingford), in Ireland, II. 383. Strangways, , II. 186 (30). -, (Strangwishe), Dr., I. 893. -, Sir Giles, I. g. 539 (33), 1330 (22); II. 195 (p. 85), 911 ii.:App. 8:g. 1150 (21). -, Henry, II. 195 (p. 85):g. 1150 (21). -, Jacob, I. 1277 iii. -, (Strangwich, Strangwishe, Strangwysse, Strangwaies), Sir Jas., I. 6 (p.7), 29 (2), 369, 392 (p. 191), 893, 1083, 1084 (p. 492), 1159, 1172 (2), 1207 (4, 10, 21), 1227 (13); II. 455 (2):App. 8:g. 1150 (18). -,-, letter from, II. App. 8. -, (Strangwisshe, Strangwish, Strangwich, Strangwyge), Thos., lord Darcy's steward, I. 303, 371, 408, 506, 852 (1, 2), 1022, 1218 (p. 561); II. 22, 23, 30. 43, 77 (p. 27), 186 (11, 19, 68). -, Thos., former master - porter of Berwick, II. 186 (7). Strasburg (Argentoratum), in Germany, I. 1310 n.; II. 315 n., 410 n., 969 n.
-, letter dated at, II. 969. Strata Florida (Strayte Flere) Abbey, Wales, I. 932:g. 311 (46). -, Ric. Talley, abbot of, I. 890, 932:g. 211 (46). -,-, letters to, I. 890, 932. Stratford, Essex, abbot of, II. 911 ii., 1060 (pp. 3734). Stratford (Stretforde) upon Avon, Warw., II. 215, 3023. -, bailly of, II. 303. -, college of, II. 909. -, guild of, II. 215. -,-, mastership of, II. 215. Stratford, Stony-, Bucks, II. 275. -, organ player of, II. 275. Stratton, Cornw., vicar of. II. App. 3. Stratton, Linc., I. g. 1103 (5); II. 187 (4, 6). Stratton, Long-, Norf., I. 1125. Streham (qu. Streatham, Surr.? ), II. 1329. Strelley, Notts., I. g. 1103 (19). Strelley, or Stirley, Sir Nich., sheriff of Notts. and Derby (15378), I. g. 539 (26), 1103 (19), 1104 (11); II. g. 191 (50), 1150 (18). -, Ric., alias Browyer, q. v.
Stretforde. See Stratford., Yorks., I. 1277. Stretham, Camb., II. g. 1008 (17). Stretton, John, II. 1068 ii. Strey, Mr., II. 186 (4). Streyt, Thos., I. g. 1330 (54). Stric, Matthew, secretary, II. 372 (p. 152). Stricheley. See Stirchley., Matthew, secretary, II. 372 (p. 152). Strickland,, ("young Strikeland,") I. 914 (p. 416). -, (Strykland), Lady, I. 1277. -, (Strikelande, Stryklond), Walter, I. 914 (pp. 41516), 1159 iv., 1199 (4), 1227 (8, 2); II. 248, 249 (6), 250 (1 ii.):g. 191 (21). -, (Stryklong), Sir Walt., dec., II. g. 191 (21). Stringham (Nthld.? ), II. 696 (2). Stroci. See Strozzi., II. 696 (2). Strodder or Strudder, Wm., II. 249, 250 (2, 5). Stroude, the. See under London, Strand. Stroode, Hen., II. g. 796 (14). 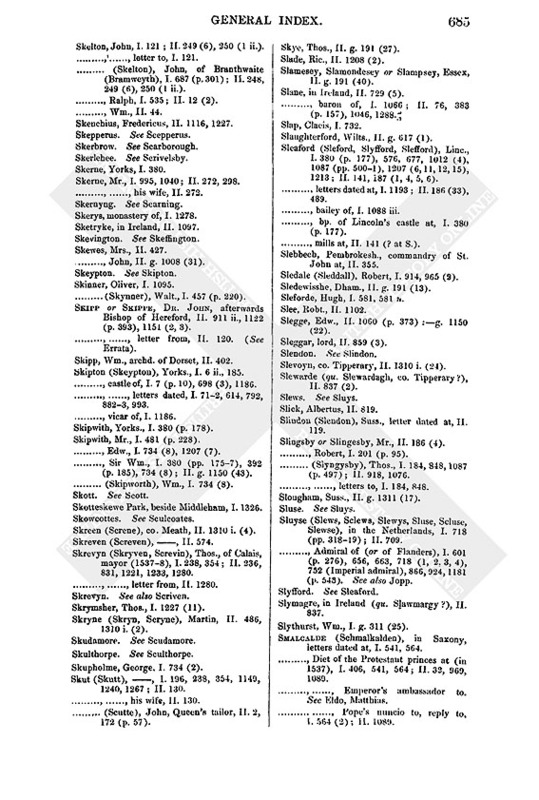 Strotty, Roger, prior of Wormesley, q. v.
Stroude (Glouc.? ), the Pote Inn at, I. 758. Strozzi (Stroci), Filippo, II. 484, 854. Struddell, Robt., S.T.P., II. g. 1311 (5). Strudder. See Strodder., Robt., S.T.P., II. g. 1311 (5). Struggull, S. Wales, I. g. (p. 267). Stubley, Lanc., I. 578 (p. 267). Stubton (Stubten), Linc., I. g. 1105 (12). Studalfe. See Stydolf., Linc., I. g. 1105 (12). Studlay, letter dated at, I. 139. Studley Priory, Oxon, I. g. 311 (47). -,-, Joan Williams, prioress of, I. g. 311 (47). Studley Priory (Black Canons), Warw., II. g. 191 (37). 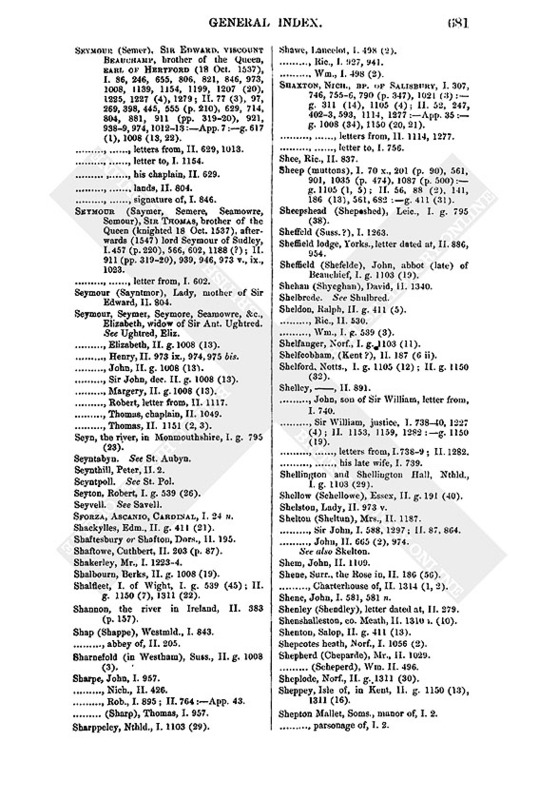 Studley or Stodley, Wilts., I. g. 311 (33). Studyfeld, Margery, last prioress of Crabhouse, I. 243. Stukeley, Great and Little, Hunts, II. g. 1311 (20). Stuping Sysse or Stowping Sise, near Doncaster, I. 6 (p. 5), 1175 ii. Sturbridge fair, beside Cambridge, I. 855, 1205; II. 513. Sturgeon, John, prior of Frithelstock, II. g. 796 (3). Sturminster (Stermyster) Marshall, Dors., I. g. 1330 (40). Sturton. See Stourton., Dors., I. g. 1330 (40). Sturton (Storton), Linc., I. 70 iv., x., 420. Sturton (Styrton), Notts., II. 321 (2). Stuttfeld, Sebastian, I. 243. See also Studyfeld. Stutton, Suff., II. g. 191 (53). -, (Studalfe), Thos., I. 457, 492. Stykford. See Stickford.-, (Studalfe), Thos., I. 457, 492. Styleman, Ant., II. 247:g. 1150 (20). Styllyard. See Steelyard., Ant., II. 247:g. 1150 (20). Suavenius, Peter, a Dane, II. 585, 745. Subberton. See Soberton., Peter, a Dane, II. 585, 745. Subbsidy, the, I. 6 (p. 3), 32, 64, 70 xi., 152, 201 (p. 86), 202 (p. 103), 344, 535, 594, 651, 1003, 1070, 1091, 1131, 1245, 1297; II. 13 (3), 276, 337, 423, 1122, 1151 (2, 3 bis), 1288 ii., 1313 ii. (5). Succession, Act of (for disposition of the Crown by will), I. 366 (p. 161), 532, 533 (p. 247), 637, 901 (pp. 404, 407, 411), 945 (3); II. 384, 935, 1053 (2), 1174, 1288 ii. bis. Sudborne, Thos. alias Manning, q. v.
Sudborough (Sudburgh), Ntht., II. 1102. Sudbourn (Sudburne). Suff., II. 1050. Sudbury, Suff., I. 32; II. 1150 (42). -, Friars of, II. 736. -, archdeacon of. See Wolman, Dr. Ric. Sudeley, Sir Ralph lord (temp. Hen. III.? ), I. 75. Suffolk, I. 32, 257, 424, 529, 1125, 1284:g. 1330 (34, 42); II. 21, 88, 272, 329, 398, 605, 1101, 1119, 1314:App. 18:g. 191 (17), 1150 (18). -, commissioners of suppression, &c. in, I. 388, 455, 510. -, (and Norf. ), sheriff of (15378). See Wyndham, Edm. Suffolk (Southfolk), Charles Brandon duke of, King's lieutenant in Lincolnshire, I. 6 (p. 6), 19 (the Duke), 40, 70 vii., 148, 198, 201 (pp. 912), 202 (p. 104), 216, 228, 291, 307, 318, 3323, 370 (pp. 1678), 380 (p. 178), 392 (p. 190), 410, 457 (p. 220), 481 (p. 228), 626, 636, 680, 698 (2, 3 p. 312), 734 (1), 846, 8489, 864, 898, 901 (p. 411), 944 (2), 946, 1087 (p. 497), 1089 (p. 503), 1125, 1186 n, 1212, 1284:g. 311 (14), 539 (3, 4, 9), 795 (4), 1103 (5, 11), 1104 (10, 11); II. 81, 133, 1567, 1712, 204, 246, 304, 329, 364, 522, 538, 771, 911 (pp. 31920), 9223, 998, 1012, 1060 (pp. 3734), 1155, 1226:App. 7, 31:g. 411 (27), 1008 (31, 43), 1150 (11, 12, 15, 16, 20, 21, 34, 41, 42), 1311 (28, 29). -,-, letters from, I. , 1212, 1284; II. 171, 364, 522, 771, 1226. -,-, letters to, I. 40, ; II. 81, 156. -,-, his son, I. 1284. -,-, signature of, I. 148, 291, 3323, 638, 846, 864. Suffolk, Katharine duchess of, I. 680, 948, 1040 (p. 477), 1188, 1267, 1284; II. 271, 538, 958. -,-, letter from, II. 538. Suicides, I. g. 1103 (4). Sulby. See Soulby., I. g. 1103 (4). Sulemount. See Soulemont., I. g. 1103 (4). Sulyard (Sulyerd), John, I. g. 1150 (42). -, (Sulierd, Swyllyard, Suylyard, Sywlyard, Sullyard, Sylzard, Sailiard), William, man of law, I. 146, 272, 299, 457, 950, 1091; II. 105, 167, 237, 272, 298, 337, 814, 911 ii., 958, 993, 1094, 1151 (1, 2), 1152, 1333:g. 1150 (34). -,-, letters from, I. 272; II. 1152. Sumpnour, Stephen, II. 58 ii. Sumrthwayte or Smorethwayte, Wm., I. 478 (2), 918 ii. Sunbryge. See Swimbridge., Wm., I. 478 (2), 918 ii. Sunderland, Dham., the Flambrughed in, II. g. 191 (27, 42). Sunninghill (Sonnynghill), Berks., II. 389, 424, 430 (2), 7601, 1147, 1241. -, letters, &c., dated at, II. 368, 375, 378, 380, 414:g. 617 (1), 796 (16). Superton. 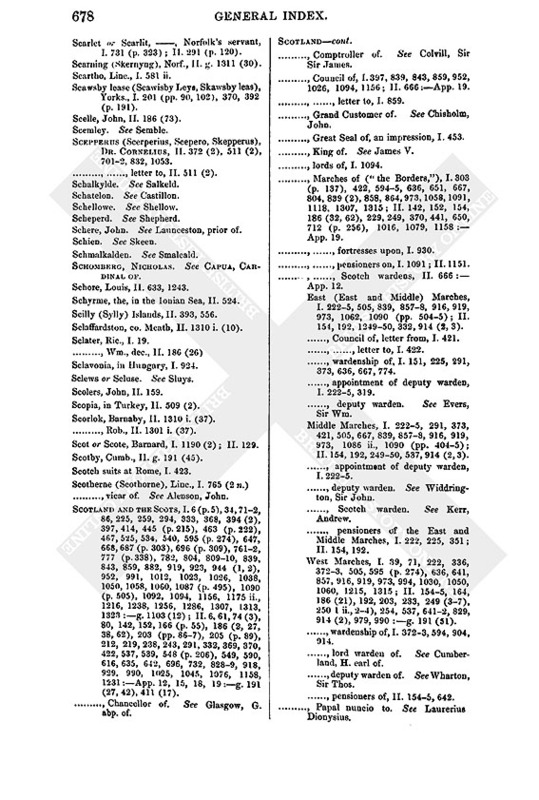 See Soberton.-, letters, &c., dated at, II. 368, 375, 378, 380, 414:g. 617 (1), 796 (16). Suppressed Monasteries, I. 1, 6 (pp. 4, 5, 8), 32, 98 (p. 51), 107, 138, 192, 302, 369 (p. 165), 378, 510, 571, 849 (p. 380), 901 (pp. 405, 409); II. 545, 548, 965, 1076. -, farmers of, 1. 6 (p. 8), 98 (p. 51) 302, 337, 498; II. 548. Suppression (and pulling down) of monasteries, I. 4, 6 (pp. 4, 8), 70 i. x.-xiii., 154, 199, 200 (p. 86, 90), 36970, 392, 393 (p. 195), 416, 455, 478, 572, 594, 678, 687 (pp. 301, 3034), 702, 783, 786 ii. (pp. 341, 343), 788, 804 (p. 357), 849 (p. 382), 892, 901 (pp. 4035, 409, 41112), 1011 (pp. 4534), 1021 (3), 1056 (2), 1087 (p. 499), 1124, 1172, 1312; II. 205, 357 (3), 473, 489, 800, 1093, 1122 ii., 1269, 1285 (p. 449). -, commissioners for, I. 32. -, exemptions from, I. 4, 9, 242, 289, 570, 773, 888, 1033; II. 79, 199, 798. Supremacy, Royal (primacy, cure of souls, &c.), I. 70 i. vi., 138, 201 (pp. 87, 92, 98102), 202 (pp. 103, 105), 275, 370 (pp. 168, 170), 652, 687 (p. 304), 698 (p. 312), 725, 730 (2), 741, 778, 786 (pp. 340, 342), 824, 841 (3 ii., 4), 842, 849 (p. 381), 881, 900 (p. 401), 901 (pp. 404, 4079, 411), 945, 1012 (4), 1021 (p. 463), 1022 (p. 467), 1087 (pp. 495, 499), 1156, 1162, 1172 (3), 1192, 1207 (8, 11), 12323, 1266; II. 65, 258, 310 (2), 315 n, 337, 4089, 717, 729 (4), 952 (p. 333), 1045, 1068 ii., 1076, 1212, 1216, 1288 ii., 1309. Surgen, Robt., I. g. 1330 (51). Surlingham, Norf., II. g. 1311 (24). Surrey, II. 975, 1181, 1314 (1, 2):g. 1150 (18). -, (and Sussex), sheriff of (15378). See Gaynesford, Nich. Surrey. See also Syria.-, (and Sussex), sheriff of (15378). See Gaynesford, Nich. Surrey, Thomas earl of, father of the duke of Norfolk, II. 186 (62). Surrey, Henry earl of, Norfolk's eldest son, I. 141, 424, 777 (p. 338), 1157, 1162, 1175 ii., 1192; II. 229, 248 (p. 104), 738 (p. 266), 839, 1012, 1060 (p. 373). -,-, his wife, II. 248 (p. 104), 973 iii. Surveyor [of Calais], Mr. See Lee, Richard. Surye. See Syria., Mr. See Lee, Richard. Susa (Suze, Zuse), in the Alps, II. 1040, 1143. Sussex, I. 725, 739, 747; II. 67, 261, 1101, 1151 (2, 3):g. 1150 (18). -, (and Surrey), sheriff of (15378). See Gaynesford, Nich. Sussex, Robt. Ratcliff, earl of, I. 86 bis, 148, 291, 302, 3323, 337, 378, 457 (p. 220), 520, 6302, 652 n, 668, 671, 695, 706, 715, 716, 743, 781, 832, 840, 842, 853, 87880, 896, 970, 1008, 1013 (p. 458), 1069, 1089 (p. 504), 1115, 1150, 1188, 1191, 1199, 1207 (20), 1227 (4):App. I; II. 77 (3), 172, 186 (40), 205, 271, 292 iii., 398, 445, 548, 581, 711, 911 ii., 911 (pp. 31920), 939, 1012, 1060 (p. 373), 1084, 1210:App. 4:g. 191 (36), 1150 (42). -,-, letters from, I. 378, 520, 6302, 695, 715, 743, 8789. -,-, letters to, I. 668, 706, 896, 1115, (3). -,-, instructions for, I. 302:App. 1; II. App. 4. -,-, signature of, I. 148, 291, 3323, 716, 832, 840, 880. Sussex, Mary countess of (1537), daughter of Sir John Arundel, I. 86, 196, 238, 450, 494, 586, 618, 634, 812, 948, 995, 1069, 1267; II. 271, 338, 424, 569, 595, 626, 711, 808, 923, 958, 973 iii., 1060 (pp. 3734), 1084, 1157, 1210, 1234, 1273. -,-, letter to, II. 1084. Sutton, Camb., II. 1008 (17). Sutton (Soutton qu. Sutton at Hone, Kent? ); letter dated at, II. 663. Sutton (Soms.? ), letter dated at, I. 1195. Sutton, Notts. I. g. 795 (38). Sutton, Surr., II. g. 1150 (3), 1311 (22). -, letters dated at, II. 267, 586. Sutton, Suss., II. g. 1008 (3). Sutton in Galtres, Yorks., II. 1181. Sutton in Holderness, I. 201 (p. 94). Sutton Bridge (upon Derwent), Yorks., I. 392 (p. 188). Sutton, King's Ntht., I. g. 1103 (30). Sutton Maddock, Salop, II. g. 411 (13). Sutton, , of Knaith, II. 186 (67). -, , former steward of Sion, II. 291. -, (Sotton), , the serjeant, II. 466. -, David, II. 729, 1310 i. (3, 37 bis), ii. (9). -,-, his "book" to the Irish Commission, II. 729. -, Sir Edw. See Dudley, lord. -, Gilbert, II. 898 (8). -, Sir Henry, I. g. 1104 (11). -, John, II. 898 (7, 8). -, Sir John. See Dudley, lord. -, (Soutton), John, of St. John's II. 663. -, Robt., II. 21 (1, 2), 1310 ii. (3). -, Thos., I. 498 (2):g. 311 (30). Suttons, Irish family, II. 898 (8). Suylyard. See Sulyard., Irish family, II. 898 (8). Suze. See Susa., Irish family, II. 898 (8). Svallo, master, an English herald, II. 1079. Swadale. See Swale Dale., master, an English herald, II. 1079. Swaffham (Sopham) Bulbeck, Camb., abbey (supp.) of, II. 1305. Swaffham, Norf., II. g. 1311 (20, 30). Swaffham Market, Norf., II. g. 1311 (20). Swale, Kent, II. g. 1311 (16). -, Wm., I. 581 ii. Swale Dale (Swadale, Swaldayle, Swadell), Yorks., I. 6 i. (p. 5) ii., 139, 178, 201 (p. 86), 217, 370 (p. 169), 775, 1021. Swan, John, I. 1316; II. 505. Swanland in Ferriby, Yorks., I. 392 (p. 193). Swans, II. 186 (74), 398. Swanwick, Hants., II. g. 1311 (40). Swarte, Ric., I. g. 539 (11). Swartmore (in Furness? ), I. 652. Swaton (Sweton), I. 70 viii. Swayne, Mich., I. 918 ii. Swenburne. See Swinburne., Mich., I. 918 ii. Swensune alias Scraptune, Dan Ralph, I. 892. Swerdes. See Swords., Dan Ralph, I. 892. Swesys. See Swiss soldiers., Dan Ralph, I. 892. Sweteman (Swetman), Lord, II. 859 (3). -, James, II. 837 (2), 859. Sweton. See Swaton.-, James, II. 837 (2), 859. Swift (Swyffte), Ric., I. 1170. Swillington, , II. 186 (11). -, Geo., I. 1159 iv., 1199 (4), 1227 (8, 2). Swimbridge (Sunbryge), Devon, II. 182. Swinburne (Swyndburne), Dr., I. 201 (pp. 98 "the Doctor's letters," 99 bis, 1012), 370 (p. 170). -, George, II. 186 (15). -, (Swenburne), John, I. 185, 220, 687 (p. 301). -, (Swyneborne), Wm., I. 1090 (p. 505). Swine (Swinhey, Swyn) Priory, Yorks., II. g. 1008 (2). -, Helen Deyn, prioress of, II. 186 (49):g. 1008 (2). Swiss soldiers (Sochyners, Swesys, Swissars), I. 12, 464, 556 (p. 259), 761, 1329; II. 31, 104, 319, 383 (p. 157), 962. Switzerland and the Swiss, I. 556, 1329 (p. 602). -, heretic cantons, II. 1148. Swords (Swerdes), co. Dublin, II. 1310 i. (43), ii. (1, 5 bis). Swords, inventory of, II. 877. Swyn. See Swine., inventory of, II. 877. Swynnowe, Robert, I. 1090 (p. 506). Sybo. See Cibo., , II. 1186. Sydenham (Sydnam), Dame Eleanor, I. 1153. -, Joan, II. g. 191 (57). -, (Sydnham), John, II. App. 30. Syderstone, Norf., I. g. 1330 (26? Sidstern); II. g. 1311 (30? Syddestern). Sydnam. See Sydenham., Norf., I. g. 1330 (26? Sidstern); II. g. 1311 (30? Syddestern). Sydnaunton. See Sidmonton., Norf., I. g. 1330 (26? Sidstern); II. g. 1311 (30? Syddestern). Sygeston, Robert, priest, I. 1089 (p. 504). Syll, Thos., I. 498 (2). Sylly. See Scilly., Thos., I. 498 (2). Sylzard. See Sulyard., Thos., I. 498 (2). Symcote, Wm., II. g. 1311 (20). Symley. See Semble., Clais, I. 524. Symond, John, I. 1183 (2). -, (Symons), Robt., II. g. 1311 (22, p. 470). -, (Symondes), Thos., I. g. 795 (33). -, Wm., II. 738:App. 30. Symondston, co. Meath, II. 1310 i. (11). Synnett or Synnot (Synet), Edm., II. 898 (5). -, Ric., II. 1310 ii. (8). -, Walt., II. 1310 ii. (8). Synnetts, Irish family, II. 898 (8). Syracuse (Saragoze), in Sicily, II. 129, 355, 792. Syria (Surrey, Surye), I. 598; II. 1122, 1127. -, the Old Moor of, I. 1190 (2). Syroksee. See Ziroczee.-, the Old Moor of, I. 1190 (2). Syson, Thos., abbot of Garendon, II. 800. Syston, Linc., II. g. 1008 (5). Sysyll. See Sicily., Linc., II. g. 1008 (5). Sywell, Ntht., II. g. 1008 (19). Sywhat, , of Norwich, II. 13 (3). Sywlyard. See Sulyard., , of Norwich, II. 13 (3).